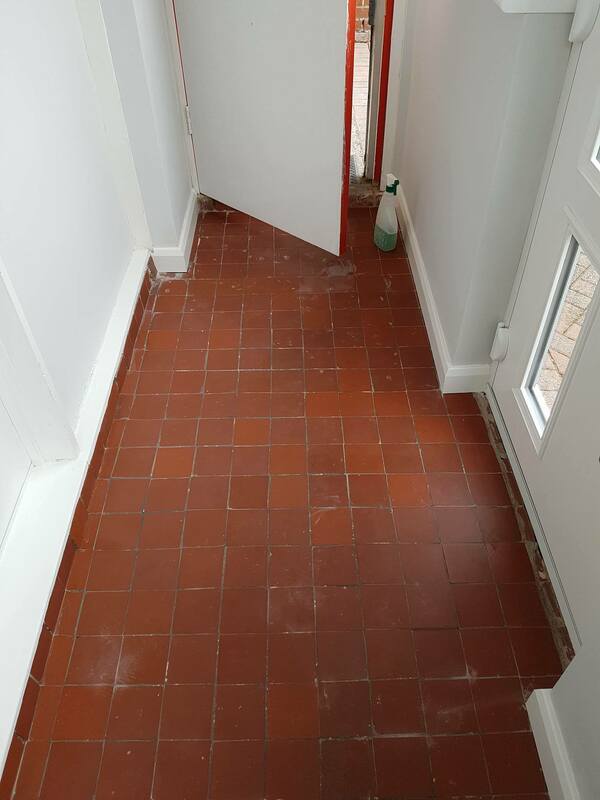 A tiled entrance porch is a great asset to any property after all first impressions do count, but since this type of feature will experience heavy traffic, it can be particularly difficult to keep it clean. 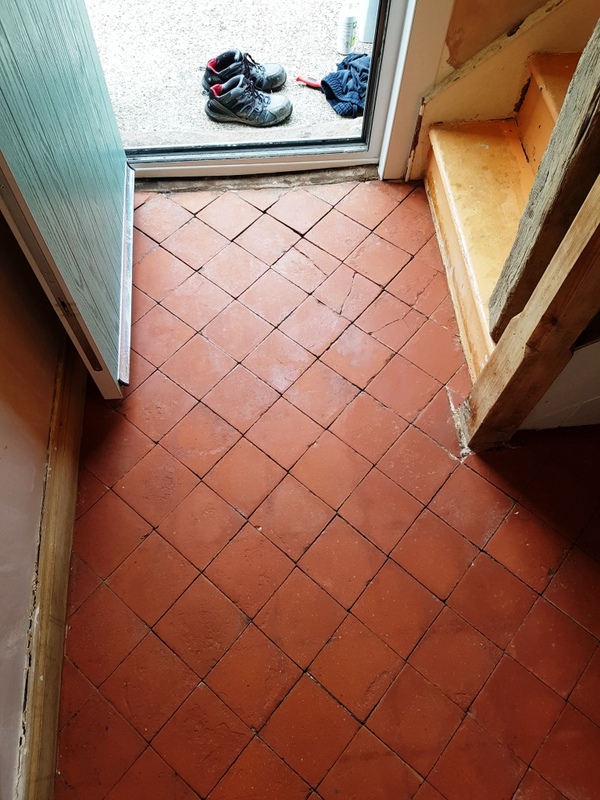 This red Quarry tiled porch at the entrance to this house in the old town of Moreton-in-Marsh was in particularly bad condition and in desperate need of restoration. 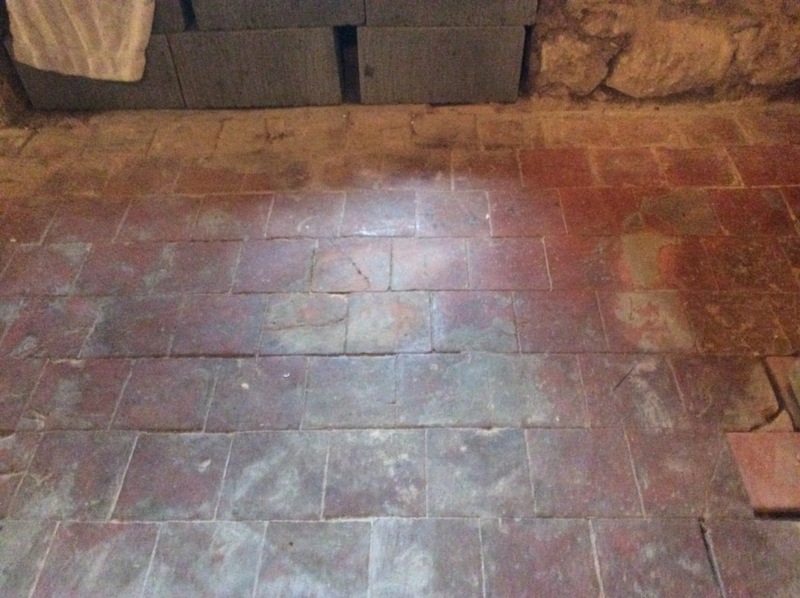 It appeared to me that some decoration work has taken place recently because the tiles were marked with all kinds of staining, including paint, cement and even glue. 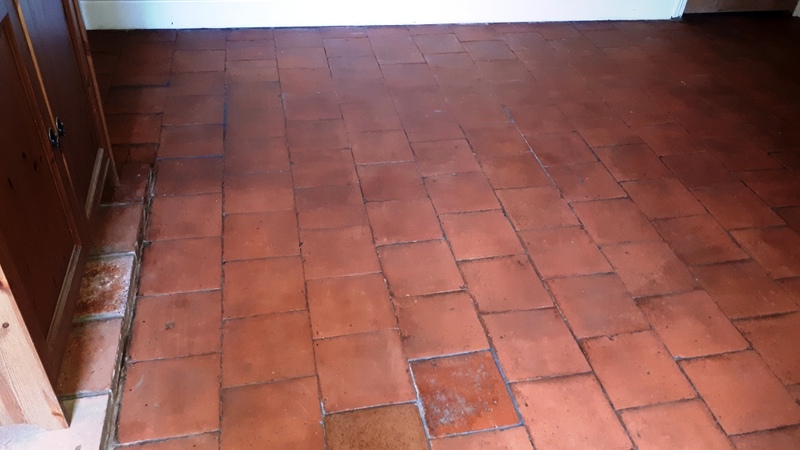 I was asked to deep clean the tiles, remove the staining and basically restore the appearance of the tiles back to their origianal condition. 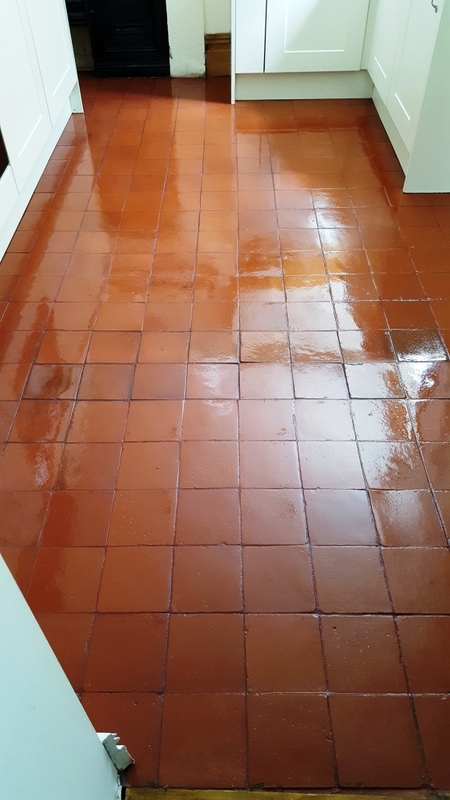 Due to the fact that the tiles were heavily soiled with paint and adhesives, I decided to clean them first using two of our most powerful cleaning products: Tile Doctor NanoTech HBU and Tile Doctor Remove and Go. 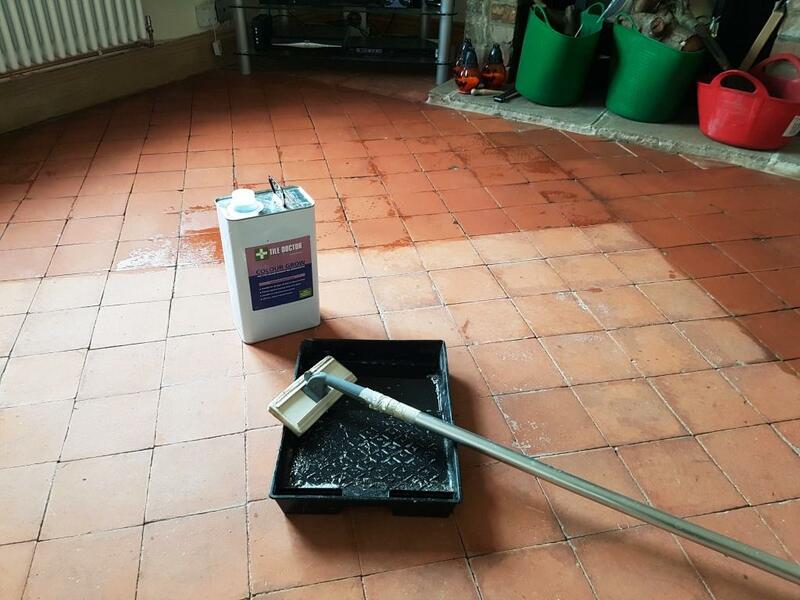 NanoTech HBU uses nano-sized cleaning particles to penetrate deep into difficult-to-reach areas of the stone and tackle ingrained dirt and staining. 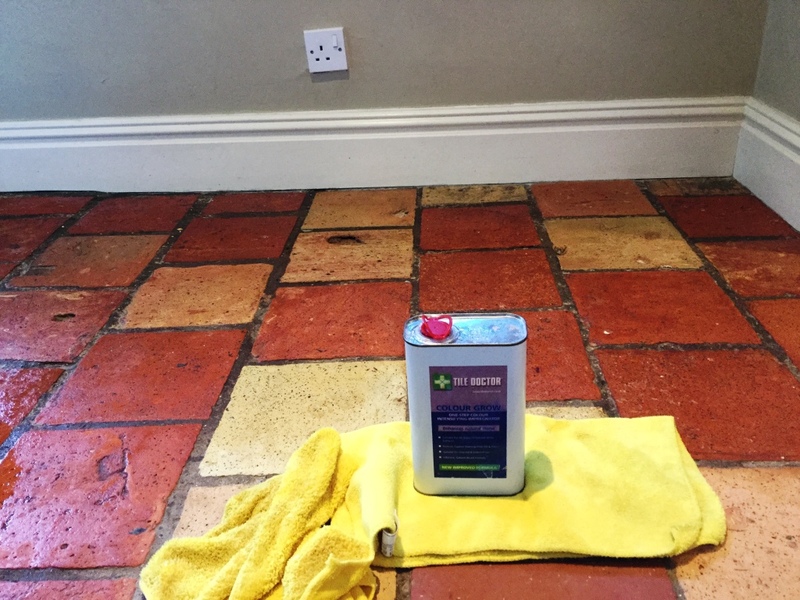 Remove and Go is specially designed to strip away paints and glues, as well as any old sealer on the tiles, combined together they produce a powerful tile cleaner. 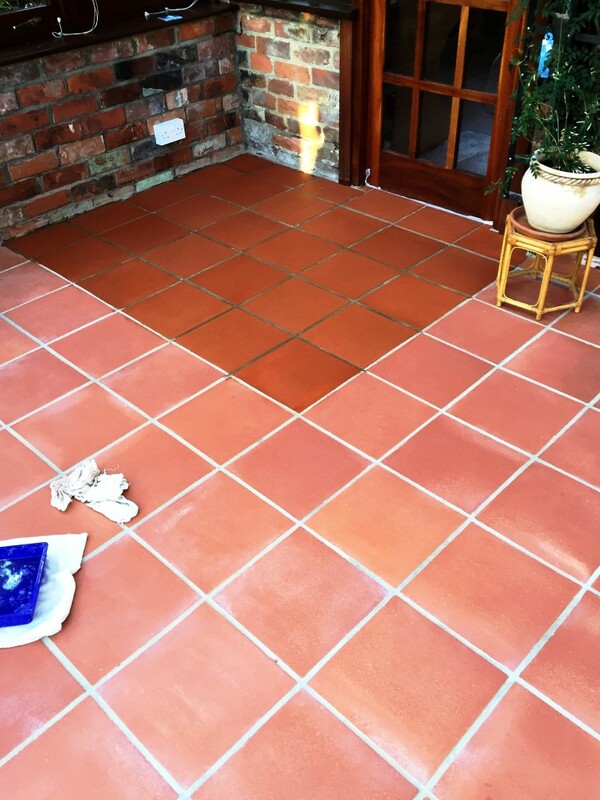 Both products were applied across the tiled porch and left to dwell for 45 minutes. Next, I used a 17″ black scrubbing pad fitted to a buffing machine (on the main surface) and a 6″ pad fitted to a hand held buffing machine around the edges. 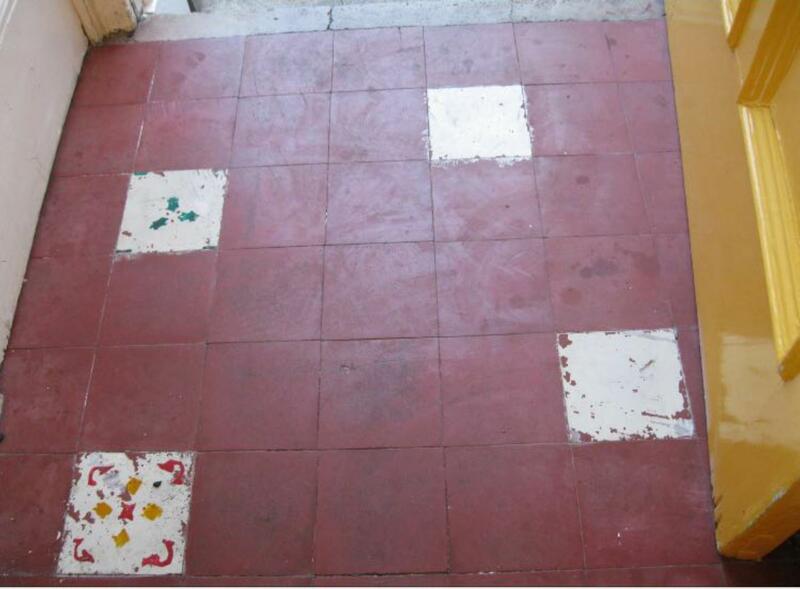 This way I able to effectively get the products into the tiles and give them a deep clean. I repeated the process several times, rinsing with water in between and extracting the soil with a wet vacuum to ensure a deep and thorough clean. Some stubborn paint and cement markings remained in places, and I resolved to spot clean these using more NanoTech HBU in combination with a handheld steamer. 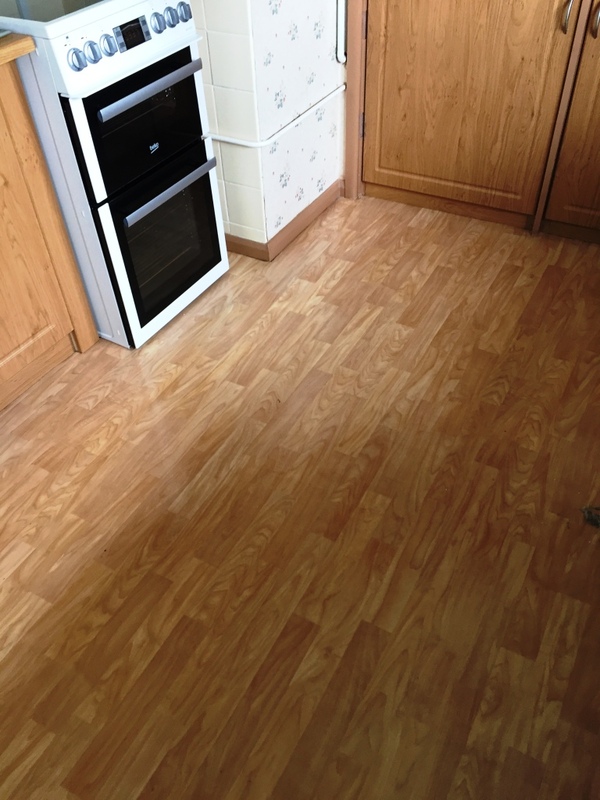 When I was happy with the cleaning results I rinsed and neutralised the floor with water. 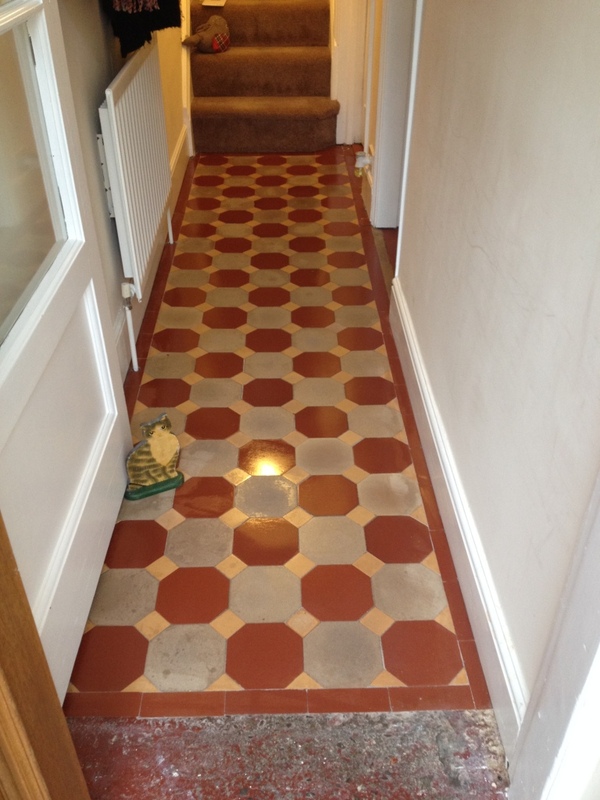 Given that it was only a small area of tiles I was able to dry them with a heat gun, leaving it ready to be sealed. 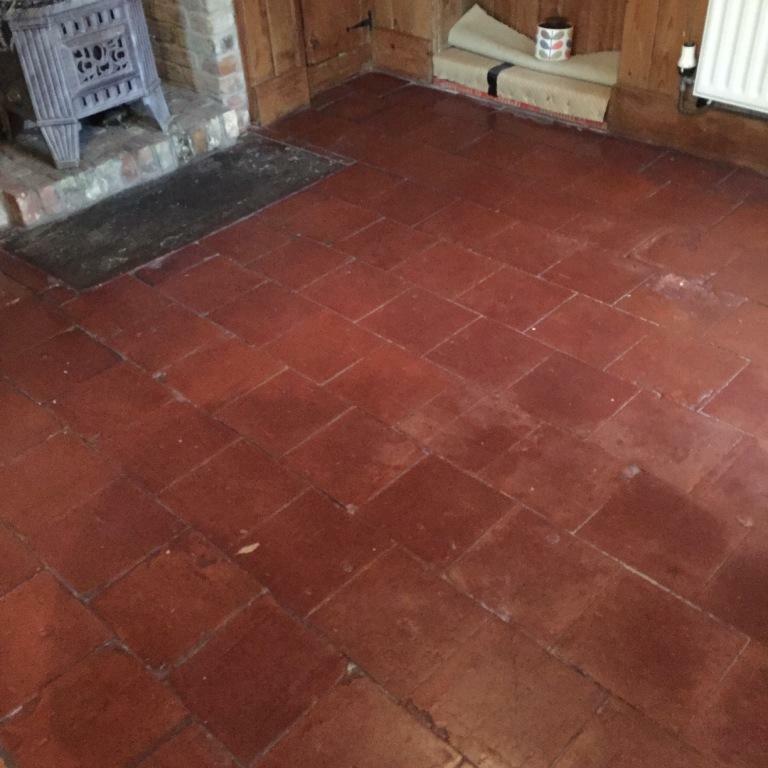 My choice of sealer was Tile Doctor Colour Grow, which was the perfect fit for these deep red Quarry tiles. Colour Grow not only seals the tiles, it also intensifies the natural shades in the stone to enhance the overall appearance of the feature. 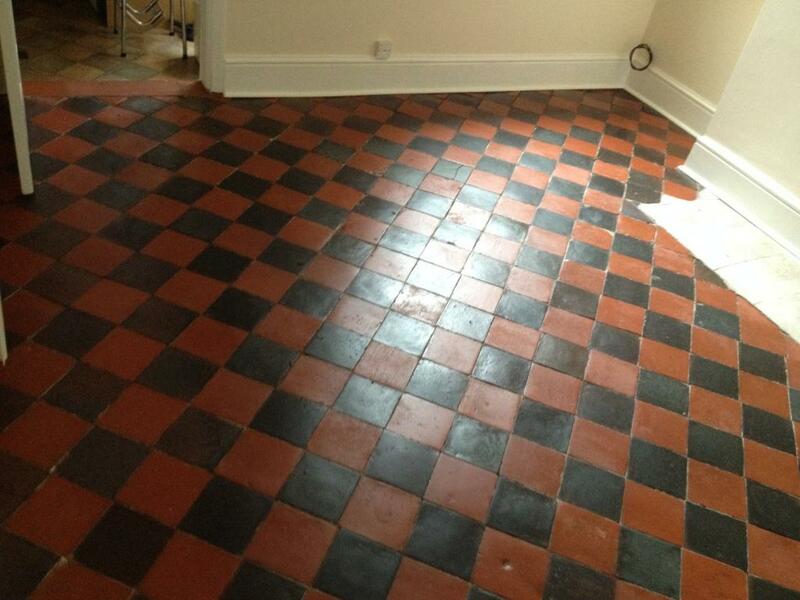 I applied four coats of the sealer to ensure the tiles will be protected and easy to keep clean for the long term. 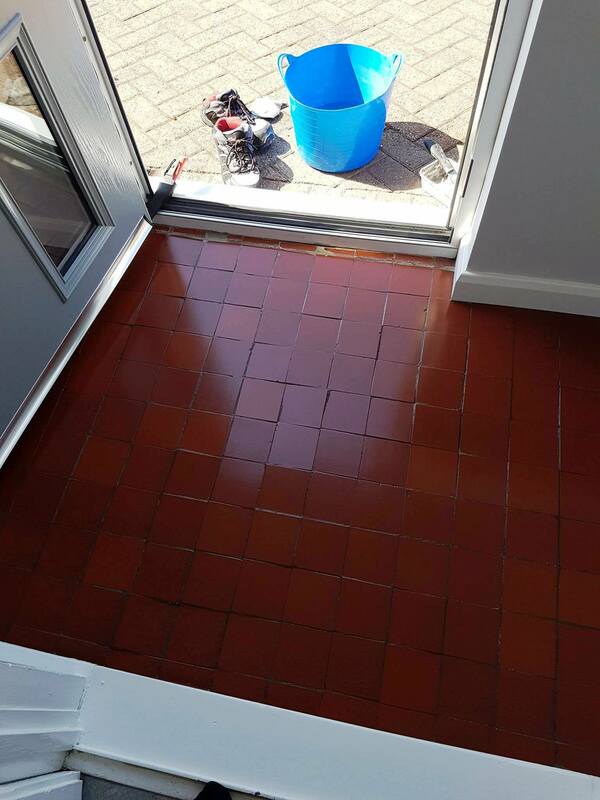 Both myself and the customer was very pleased with the transformation of the porch floor. 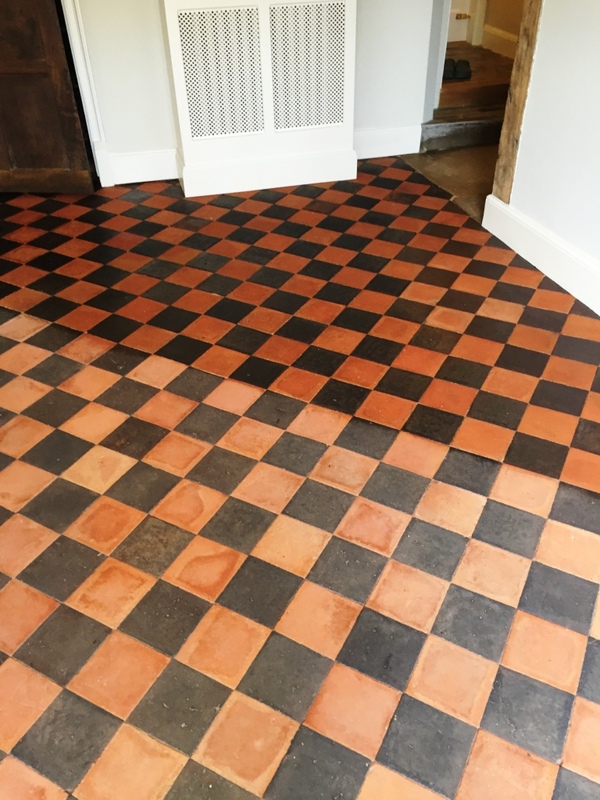 Details below of a red and black Quarry tiled floor at a house belonging to a customer in the Shropshire market town of Shrewsbury, which dates back to medieval times. 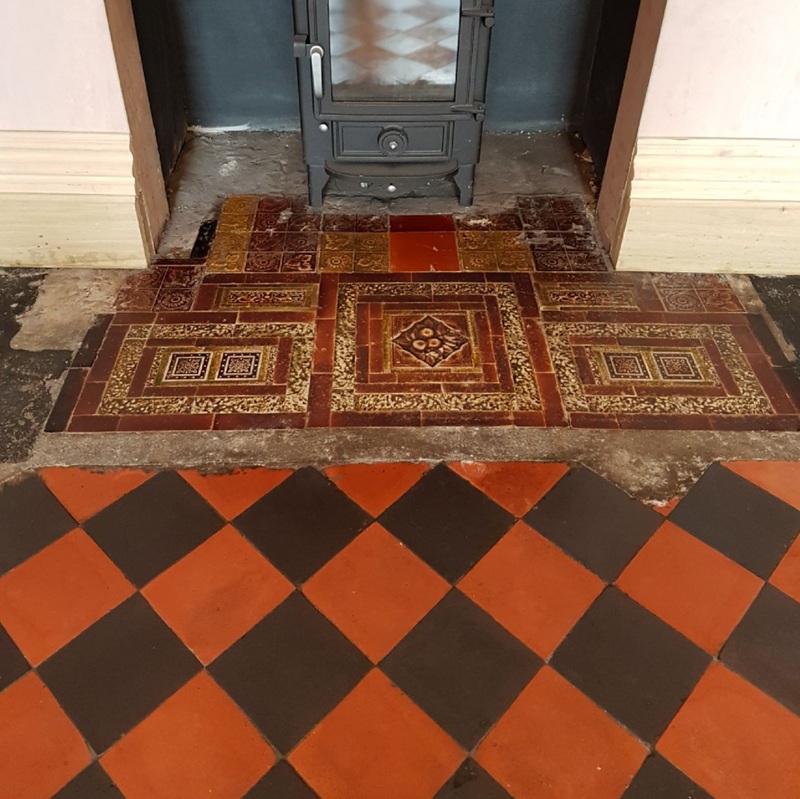 The owner had recently moved back to the area and purchased the house with the intention of restoring all its original features including the Quarry tiles floor which had several coats of red floor paint and had been covered with carpet for several years, I guess the previous owner wasn’t sure what else to do with it. 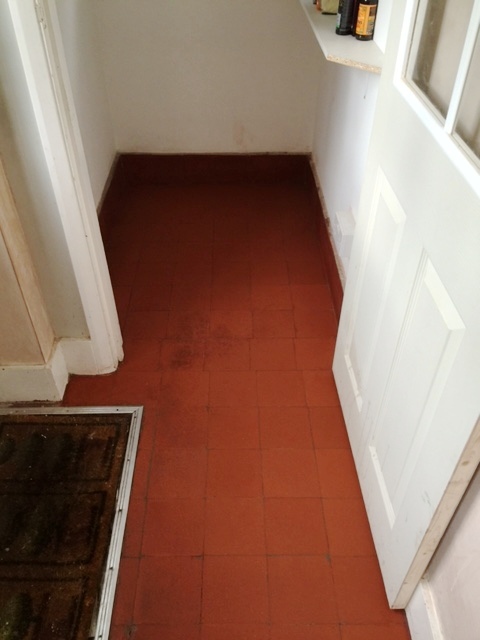 I was also asked to refurbish the Victorian Tiled hallway and porch which was in an equally neglected state. 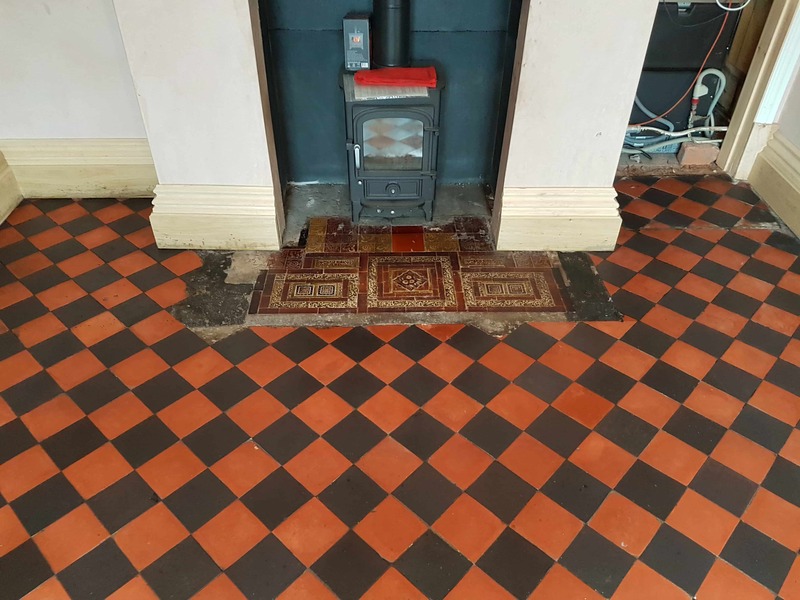 Naturally this is exactly the sort of thing we do so I was confident the floor could be significantly improved with our assistance and after popping round to take I look provided a quote although due to other priorities it was a whole year later before I was asked to come and do the job. 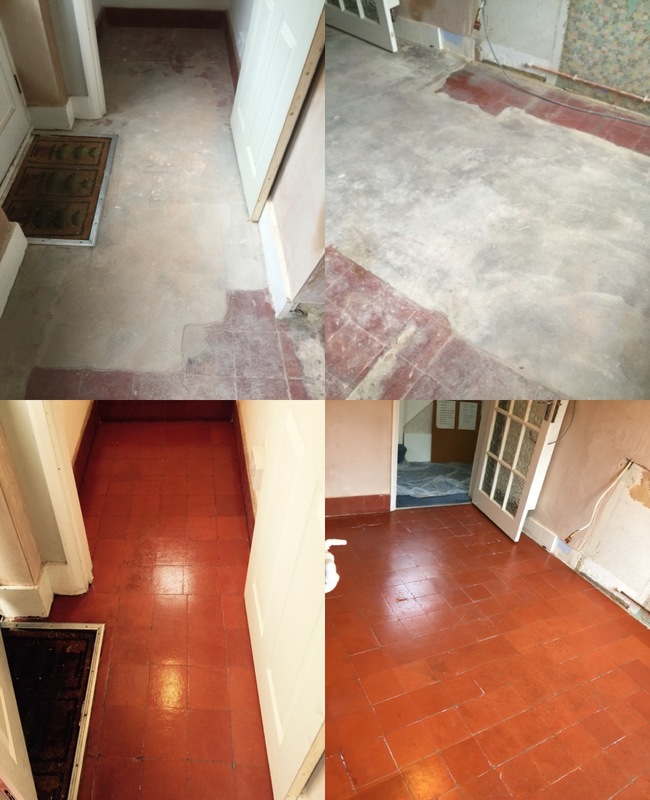 There was cement based building residue, plaster and efflorescence on the floor so I decided to treat the floor with a strong dilution of Tile Doctor Remove and Go which was left to soak into the tiles for a while before being scrubbed in using a rotary machine fitted with a black pad; the resultant slurry was washed away using more water and a wet vacuum. 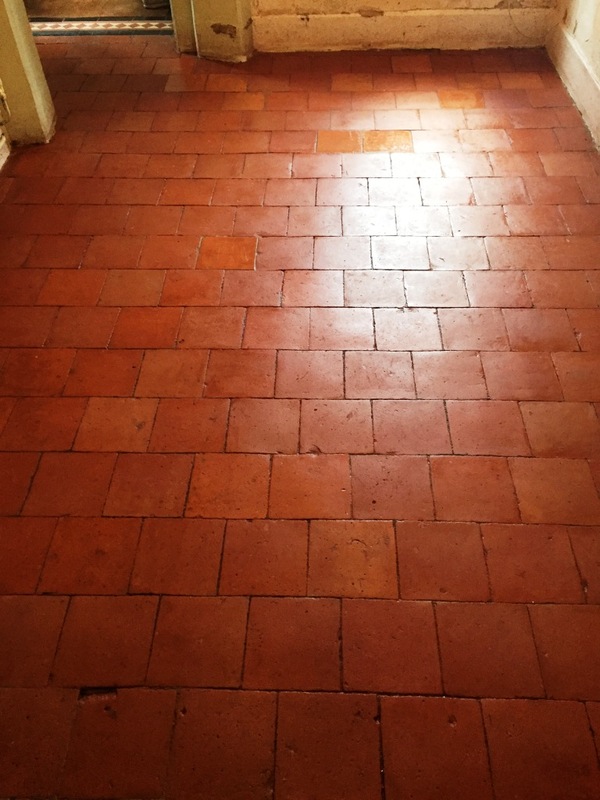 The whole process was repeated until I was satisfied that any stubborn areas had been dealt with and then the floor given an acid wash with Tile Doctor Grout Clean-up to remove the efflorescence. Once I was happy with the condition it was given a final rinse to remove any trace of cleaning products and then left to dry for four days. 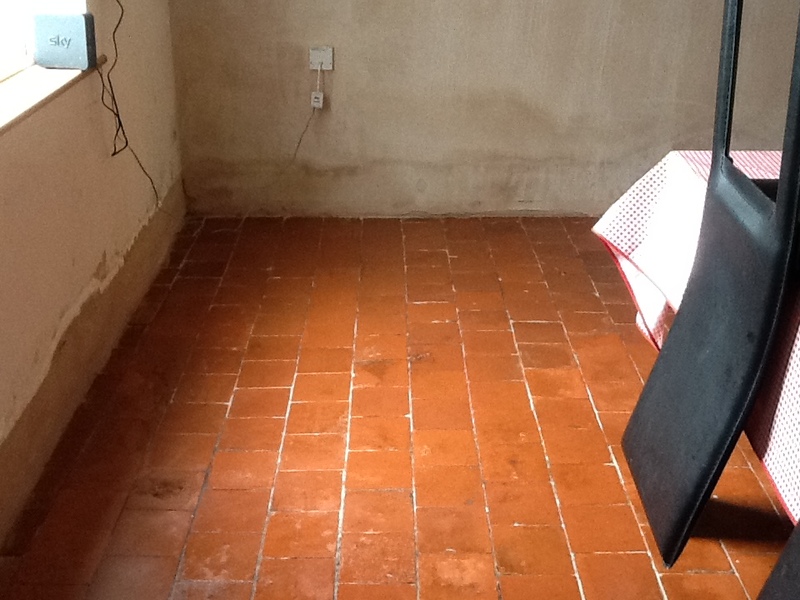 The tiles have to be dry before sealing and after testing the floor with a damp meter I confirmed that four days has been sufficient and the floor was indeed dry. 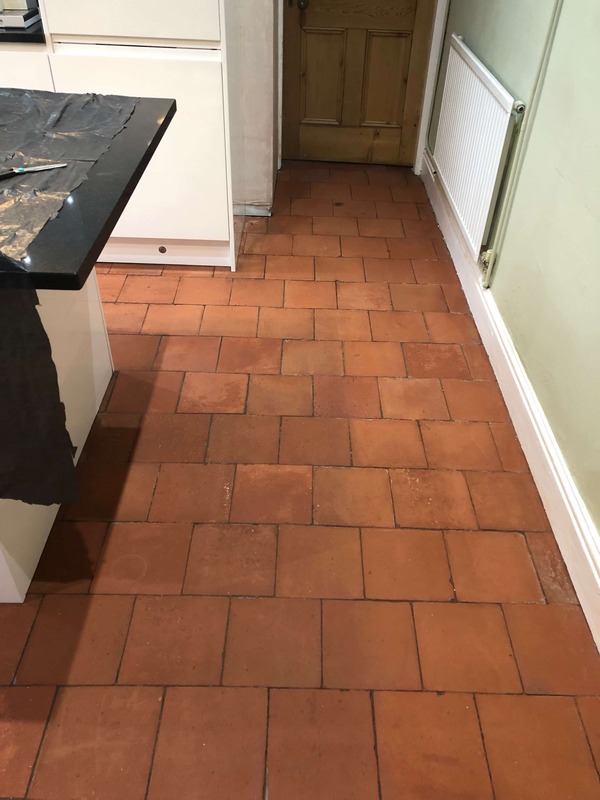 The next step was to apply three coats of Tile Doctor Colour Grow which is an impregnating sealer that occupies the pores in the tile and enhances the natural colour of the tiles in the process. 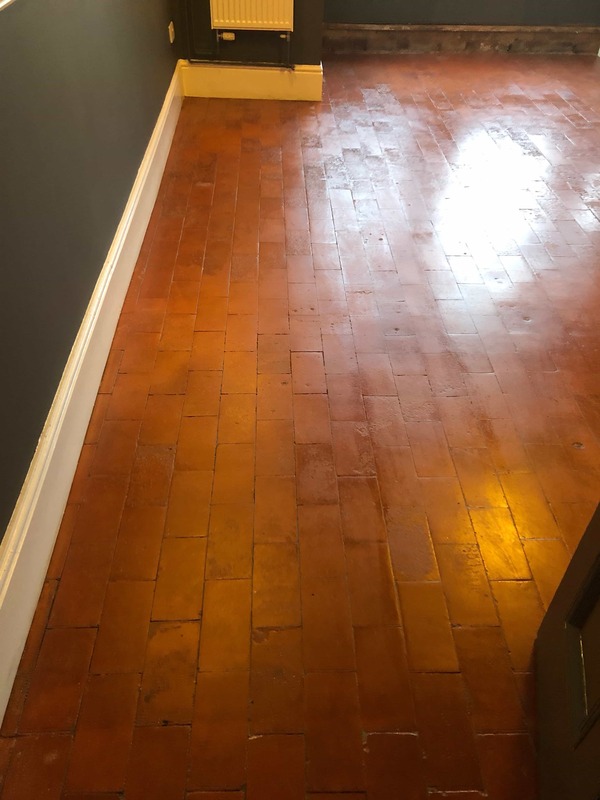 I was able to use the same cleaning and sealing process on both floors and I think you will agree it made quite a difference and both floors have been transformed. 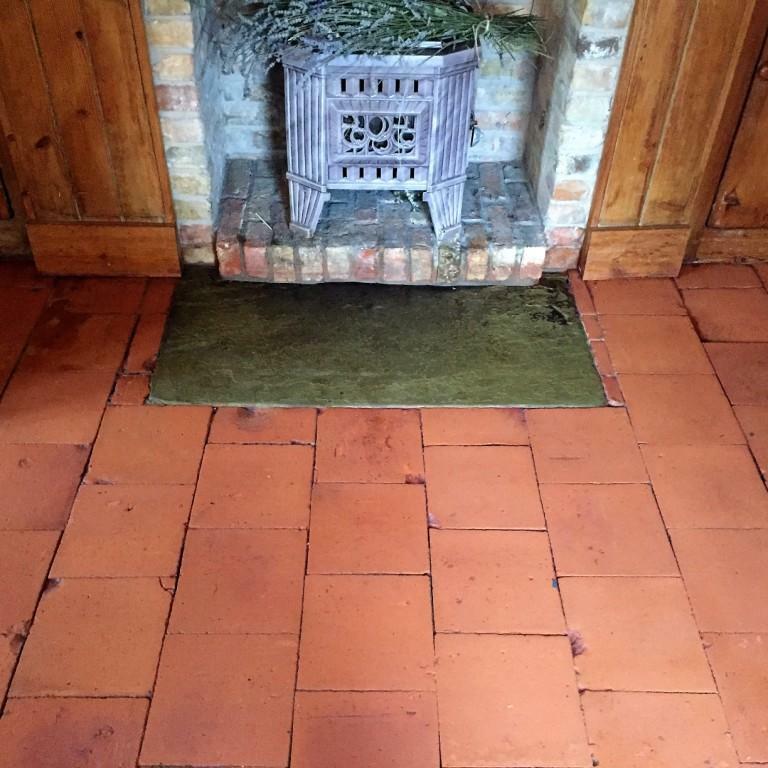 The photographs below are of a very old Quarry Tiled hallway floor taken at a beautiful 18th century farmhouse near Hemel Hempstead; the floor was believed to be original and the customer wanted it repaired and restored. 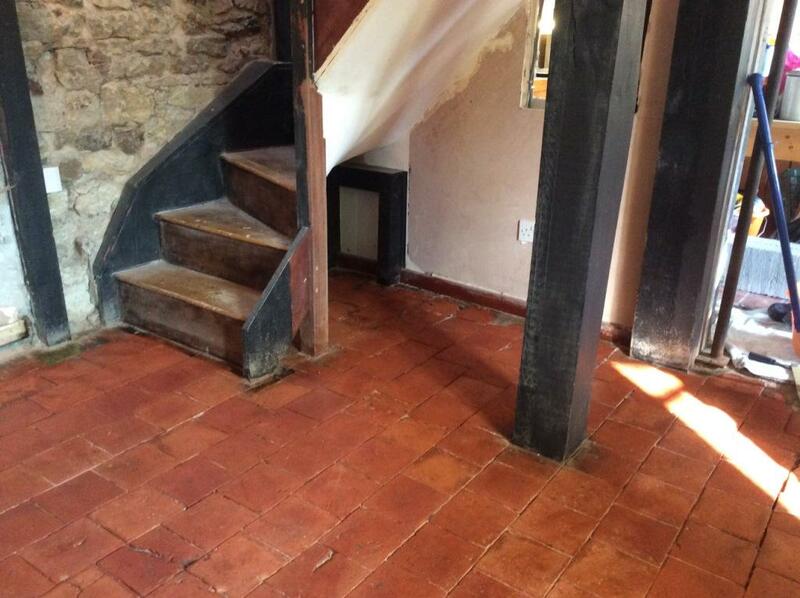 Before starting the cleaning process we made sure to protect any vulnerable areas such as the oak panelling on the staircase and then set about repairing the broken tiles which were replaced with matching reclaimed quarry tiles. 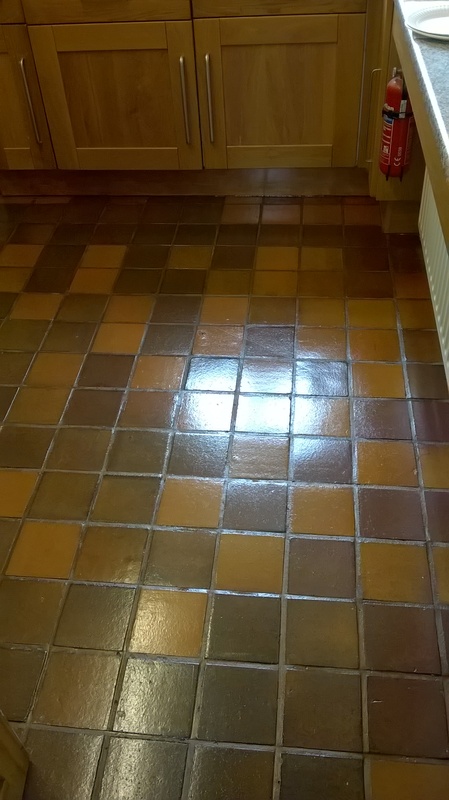 Once the replacements and new grout had set we made a start on deep cleaning the Quarry tiles and removing remaining old stubborn waxes and polishes by applying Tile Doctor Remove & Go combined 50:50 with Tile Doctor Nano-Clean which combine to form a very effective stripper and cleaner. 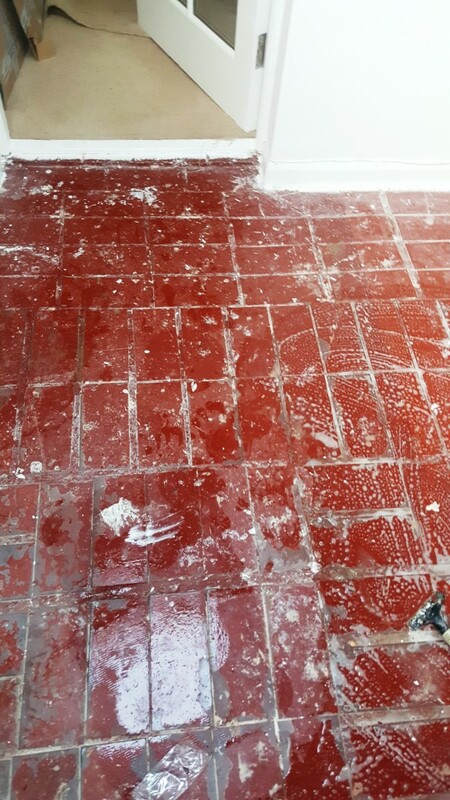 The solution was left to soak into the tile for a good ten minutes before being scrubbed in with detail brushes and scrubbing pads fitted to a rotary machine. 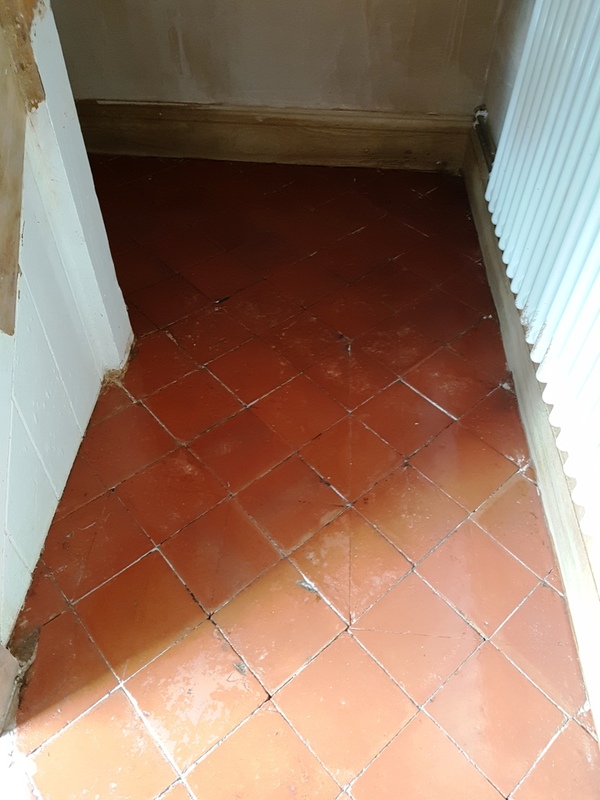 The resulting soiled solution was rinsed off with water and extracted using a wet vacuum which allowed us to see the underlying condition of the tiles which indicated more work was required especially to the grout. To get the grout looking cleaner it was treated with a strong dilution of Tile Doctor Pro-Clean which was then scrubbed into the grout manually using a stiff grout brush; the soiled cleaning solution was then rinsed off and extracted using a wet vacuum and then the whole floor was given a further rinse and also a steam clean to remove any trace of product. 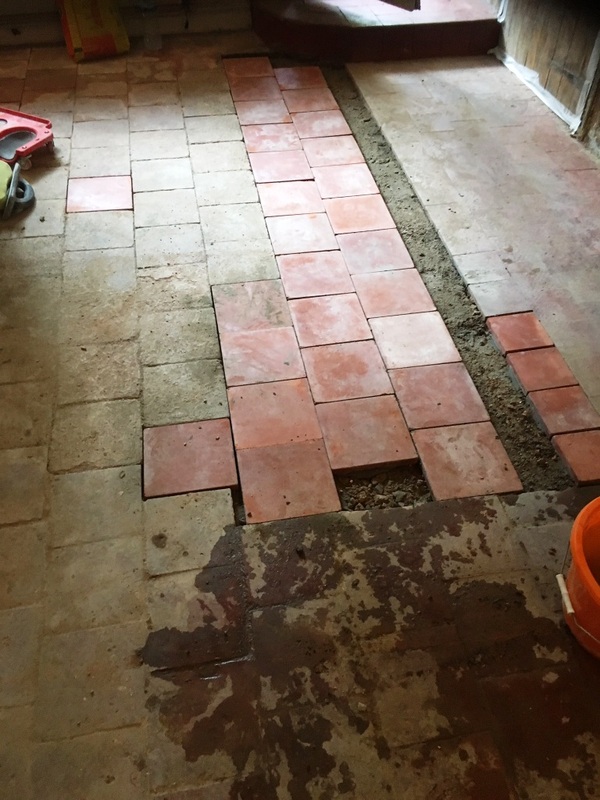 It’s essential that tiles are bone dry before sealing so we left the floor to dry for a full seven days before returning. 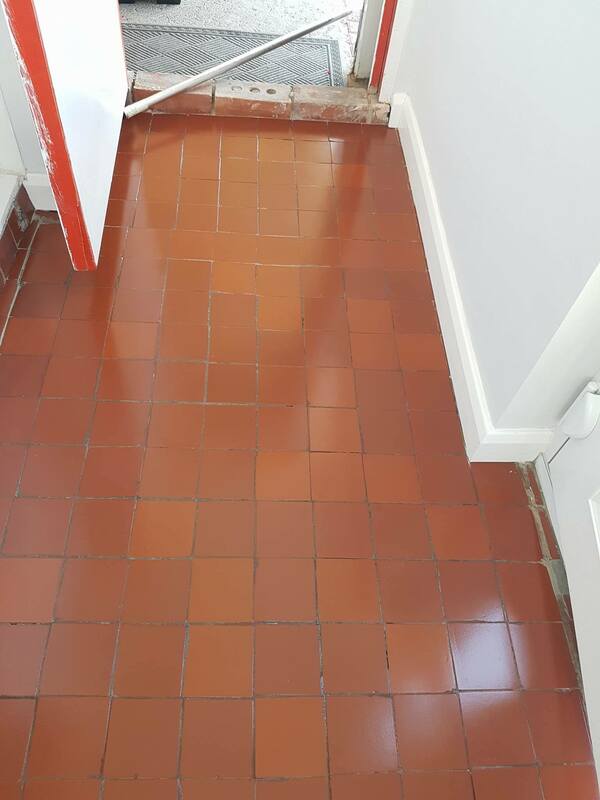 To get the best out of the floor I decided to seal the floor with two different but compatible sealers; first a single coat of Tile Doctor Colour Grow was applied which is an impregnating sealer that restores colour to the tile and protects it from stains by occupying the pores in the clay. 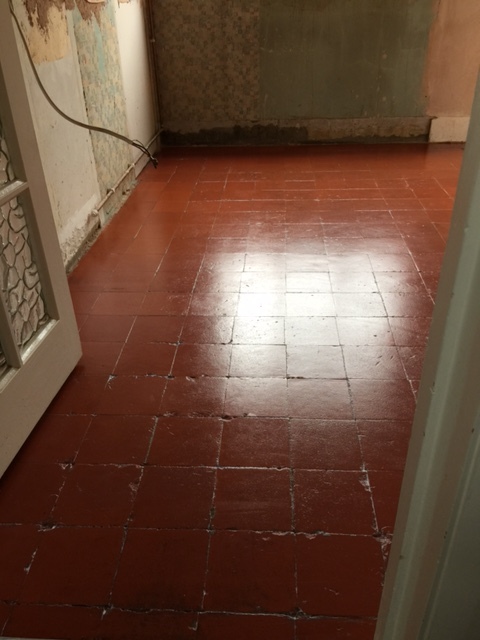 Once the Colour Grow had dried it was followed with six coats of Tile Doctor Seal and Go Extra which is a special acrylic based formula that promotes moisture vapour transmission which is essential for these old floors where no damp proof course was installed. 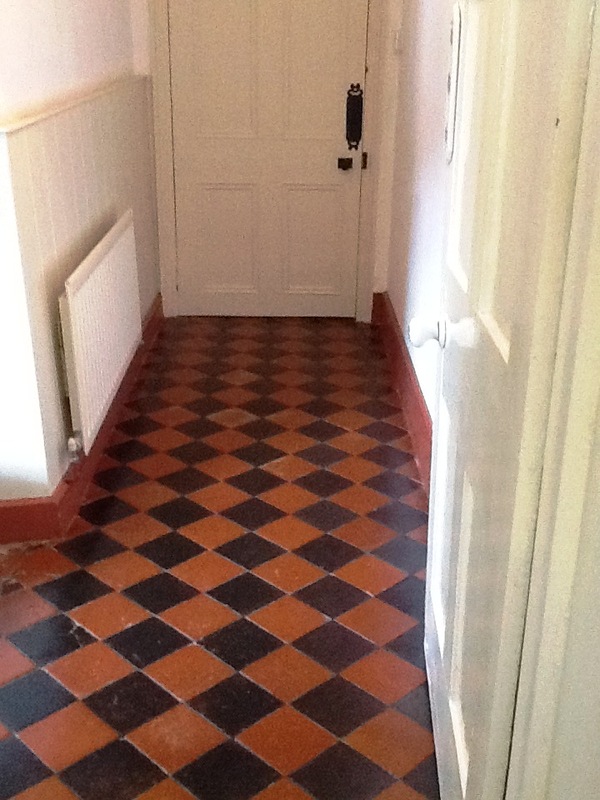 I’m pleased to say the restoration went very well and as you can see the quarry tiled hallway floor now looks fantastic. 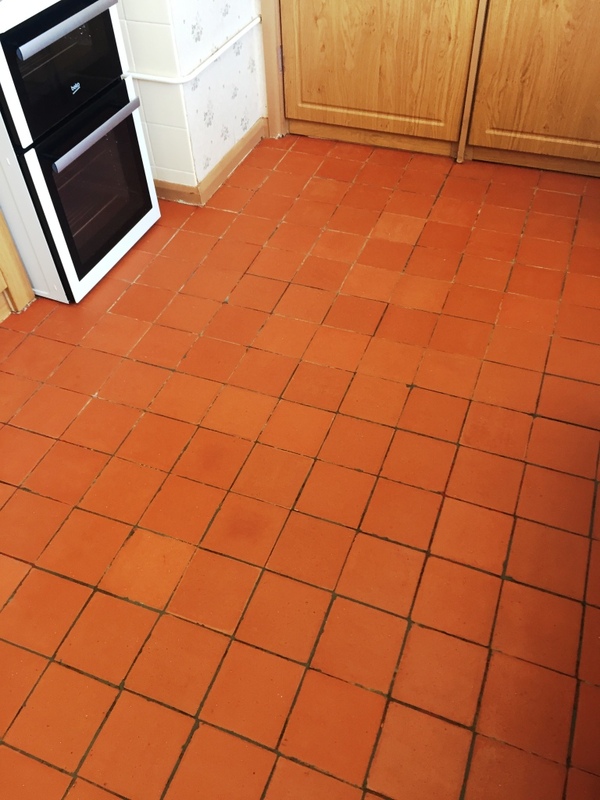 What causes a tiled floor to become dull and discoloured? Typically, it’s a combination of heavy soil build-up and an ineffective approach to cleaning and maintenance. 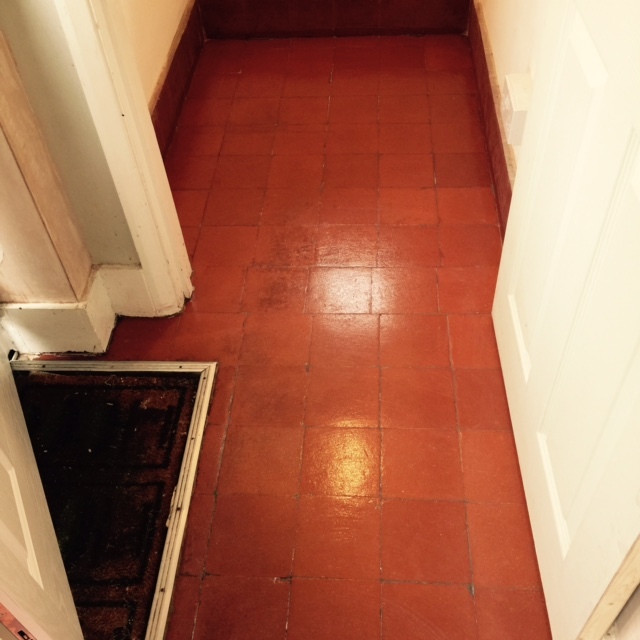 Such was the case with this heavily soiled Quarry tiled hallway floor in Bedford. 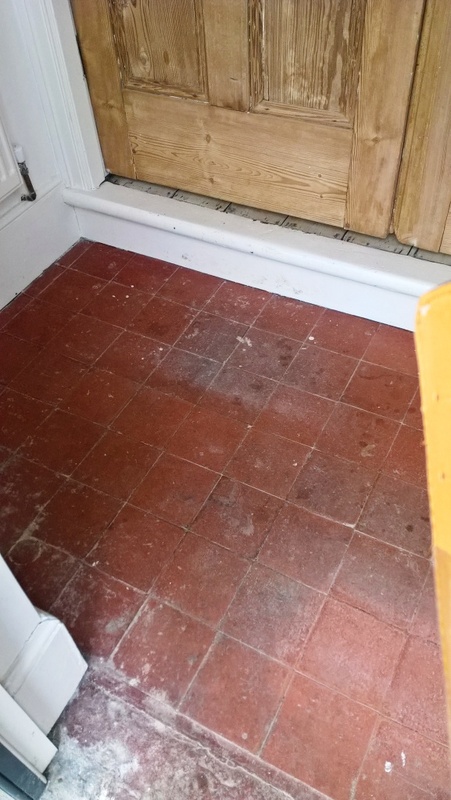 A further problem was that the tiles were very pitted and at some point, in the past they had been filled with grout, additionally, when I took a closer inspection of tiles, I established that there was a wax sealer present on the floor that has bend topped up from time to time – without the tiles being deep cleaned. This has caused an accumulation of soil trapped between multiple layers of wax. The result? 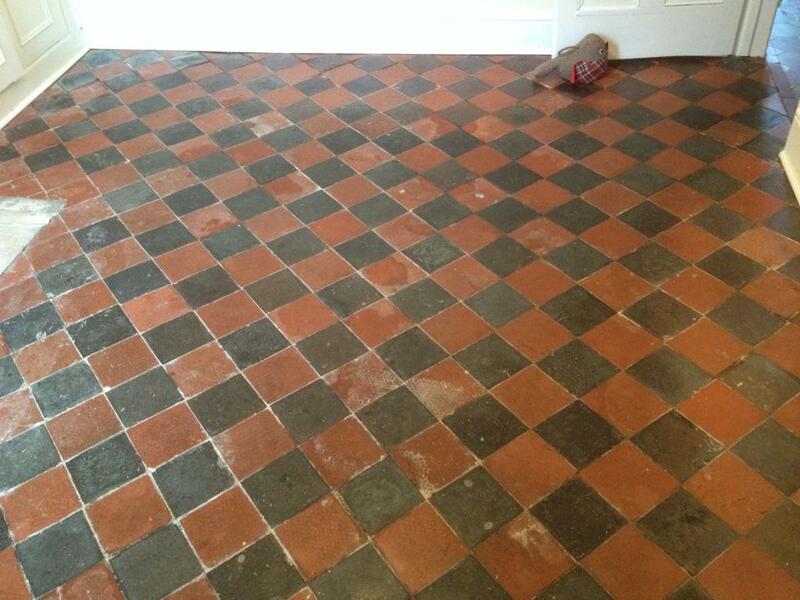 Extremely dull and unattractive Quarry tiles that the customer was desperate to get back to looking their best. 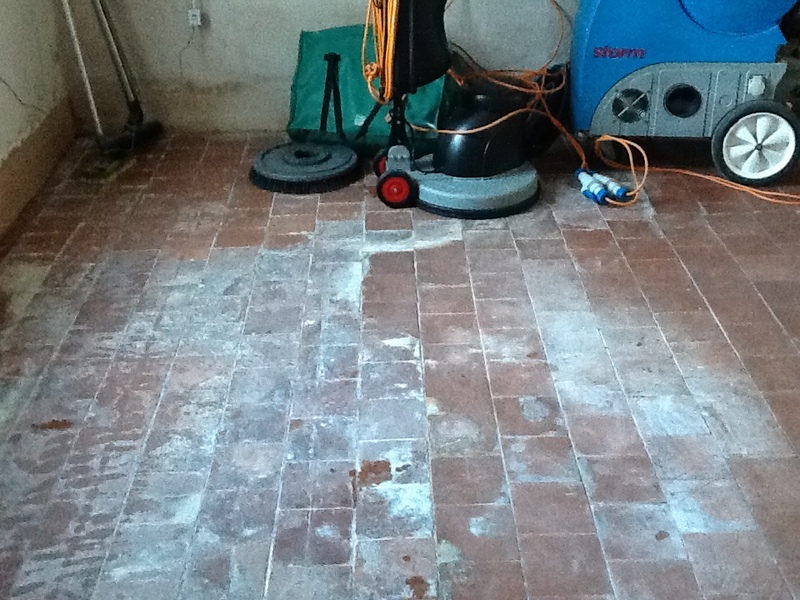 My first course of action was to vacuum the floor thoroughly to remove any small quantities of grit or loose debris. 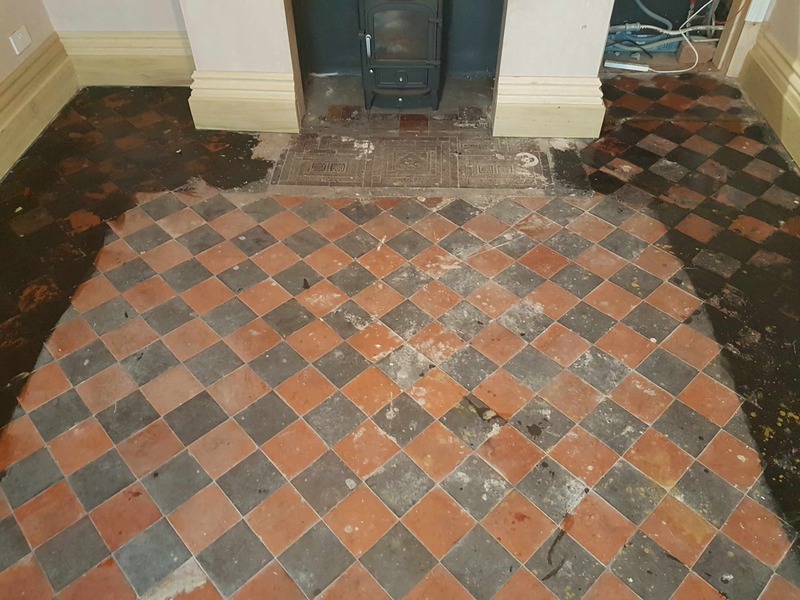 I then masked up the carpet and radiator to protect them before mixing up a strong dilution of Tile Doctor Pro Clean mixed with hot water. 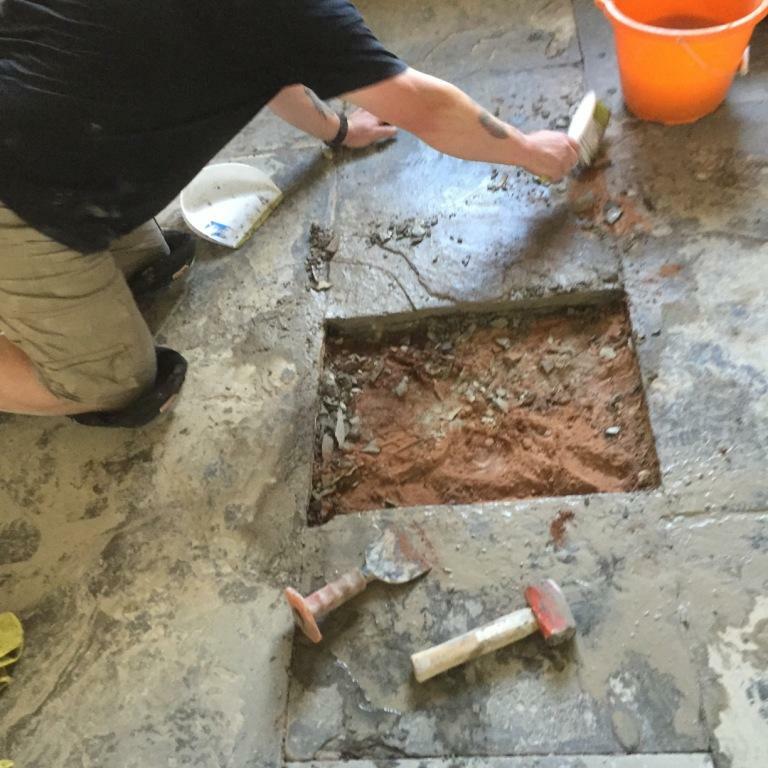 This was then applied to the surface of the floor in small areas of three square metres each. 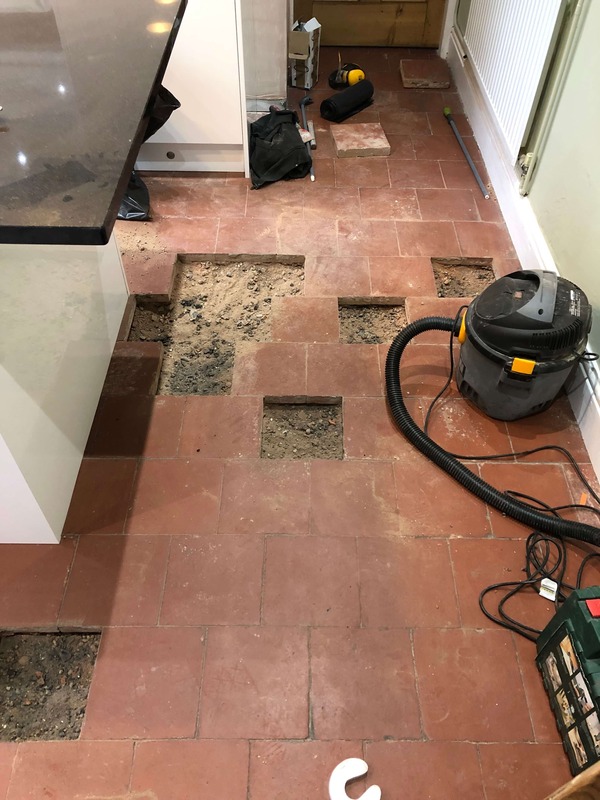 The high alkaline cleaning product was left to dwell for a short period before I agitated the tiles with a black stripping pad to remove the heavy soil. The resulting cleaning slurry was extracted with a wet vax machine. This cleaning process was repeated throughout the entire area. 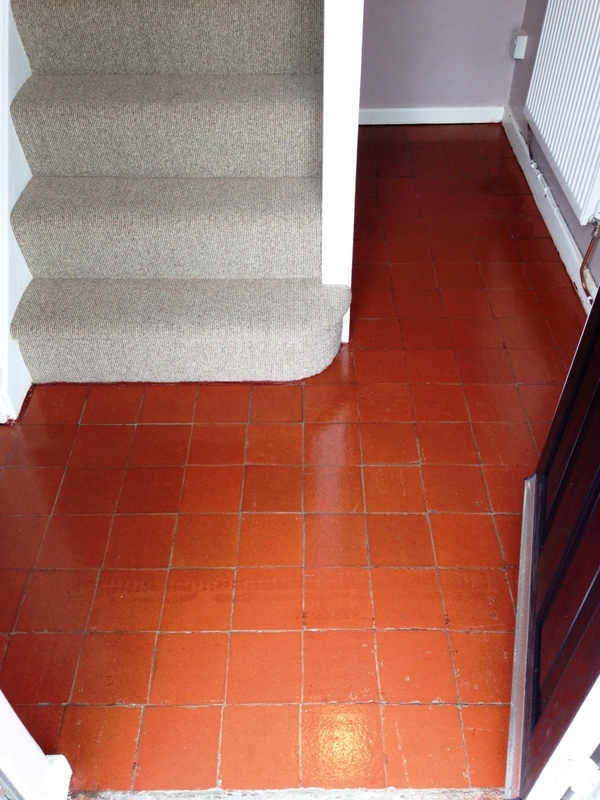 Inaccessible places, such as under the radiator and stairs, were manually cleaned using hand brushes. 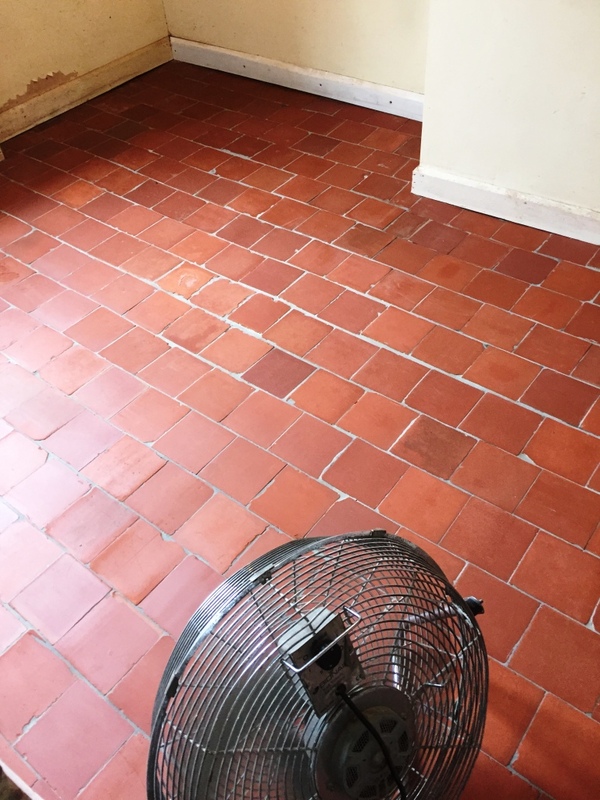 I then dried the floor with a fan for 30 minutes, before mopping on a solution of the acid-based Tile Doctor Grout Clean Up to neutralise the Pro Clean and removing the dirt on the grout lines with the hand brushes. The area was allowed to dry completely overnight. 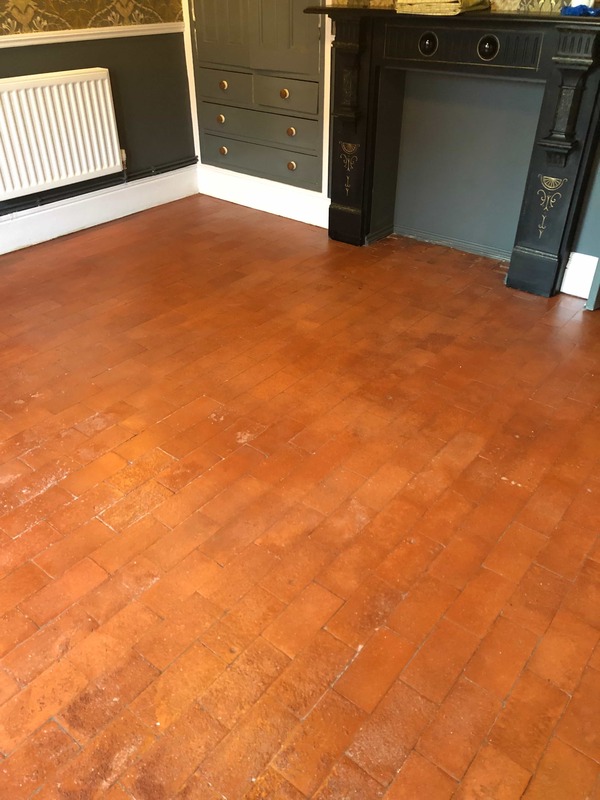 I returned the following day and applied two different types of sealer in two separate test areas so the customer could get a better idea of the final effect that would be achieved. 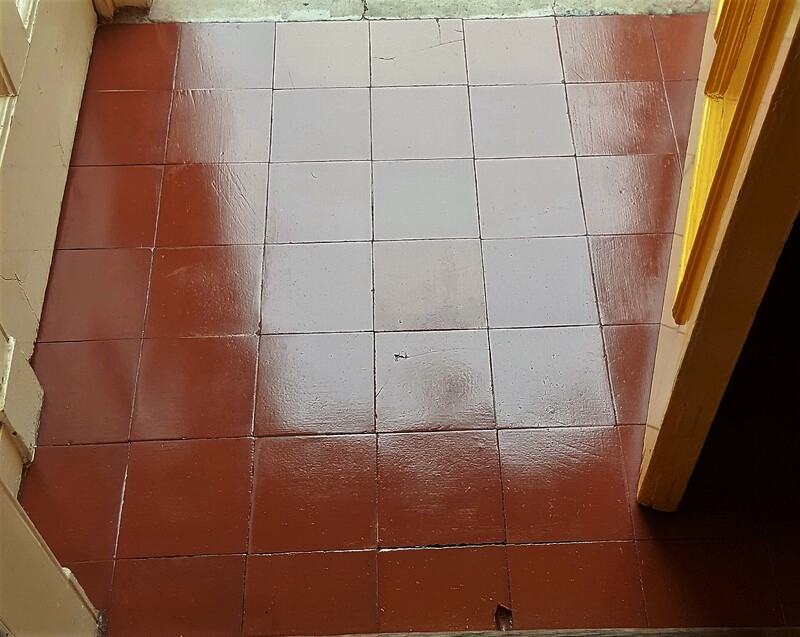 The customer could’ve opted for Tile Doctor Seal and Go, which is a topical sealer that provides a high quality, durable low-sheen finish. 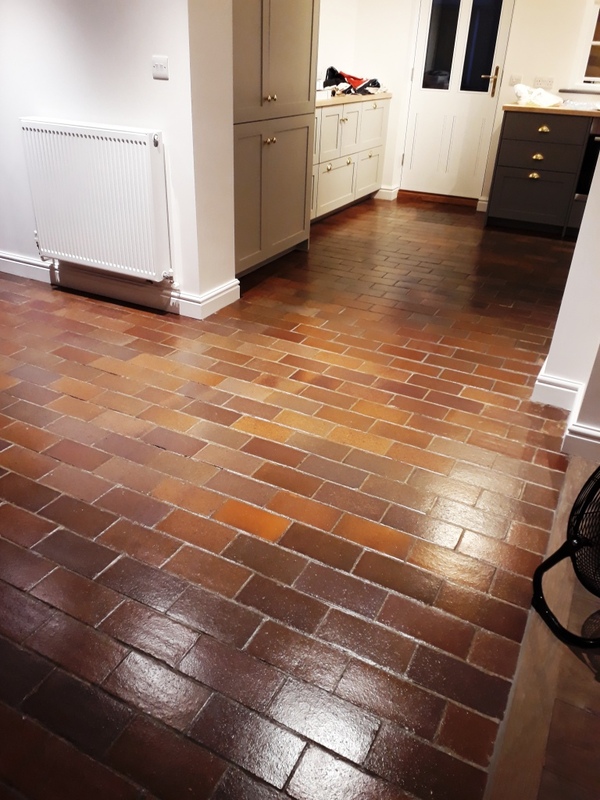 However, after further discussion, it was decided that the best product would be Tile Doctor Colour Grow, which is an impregnating sealer that penetrates the tiles and provides a more natural finish, emphasising the colours in the stone. 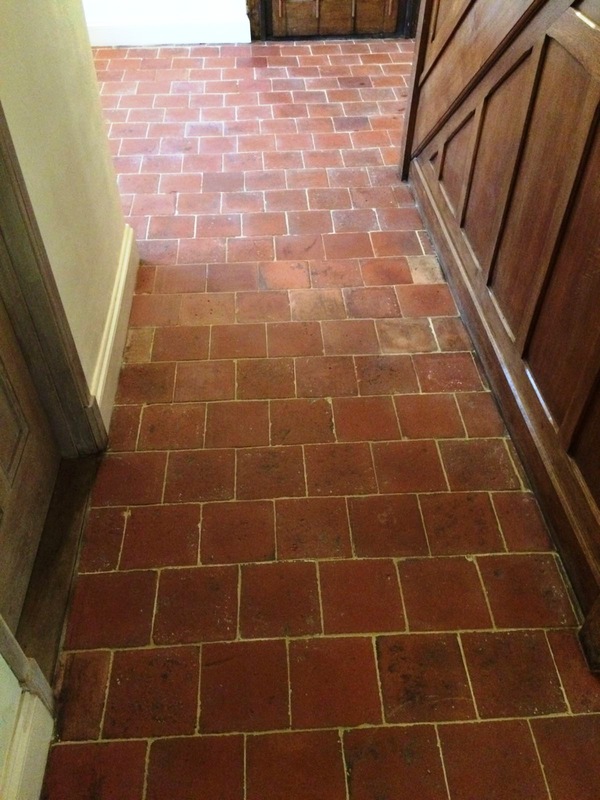 As you can see from the photos above, a deep clean and fresh seal truly worked wonders for these Quarry tiles. Both myself and the customer were very happy with the outcome of the work. 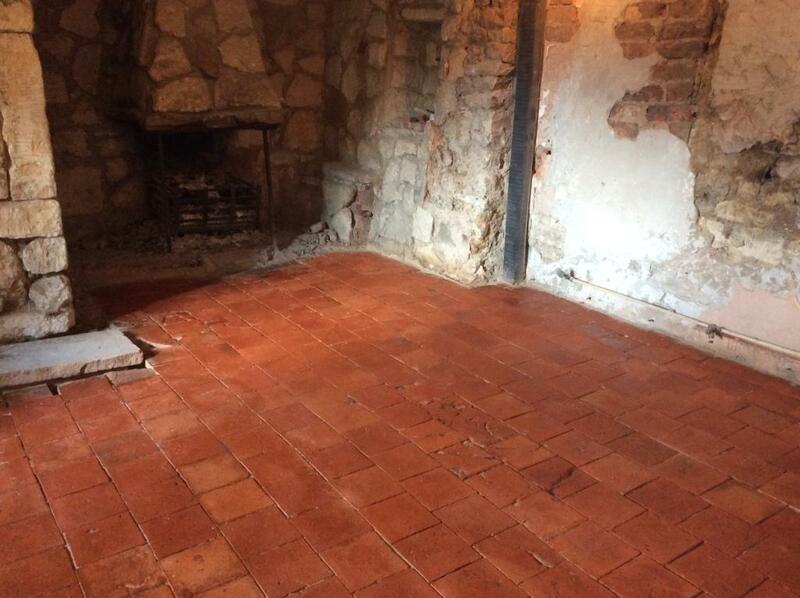 This customer had just bought a house in the small Shropshire village of Nesscliffe. 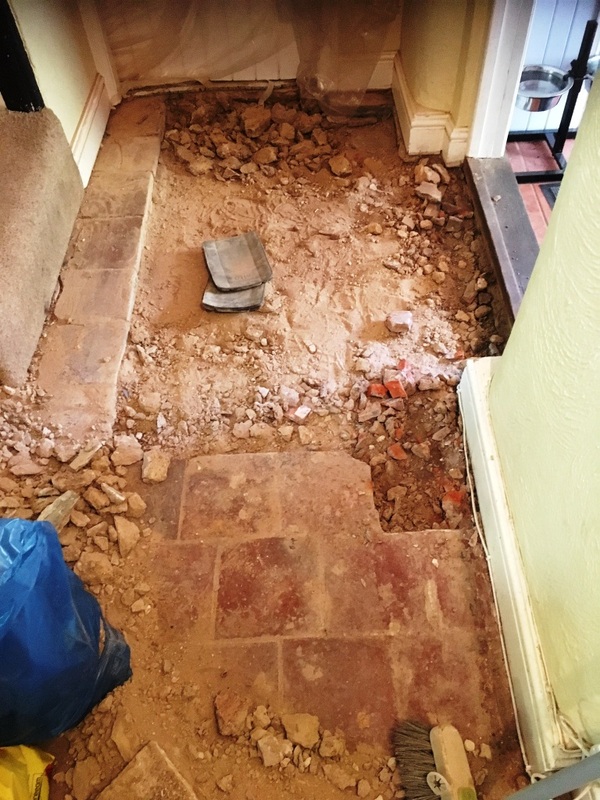 Like many new property owners, she was keen to make some changes to the interior decoration, deciding to pull up the carpet they she didn’t like that covered almost the entire ground floor of the house. 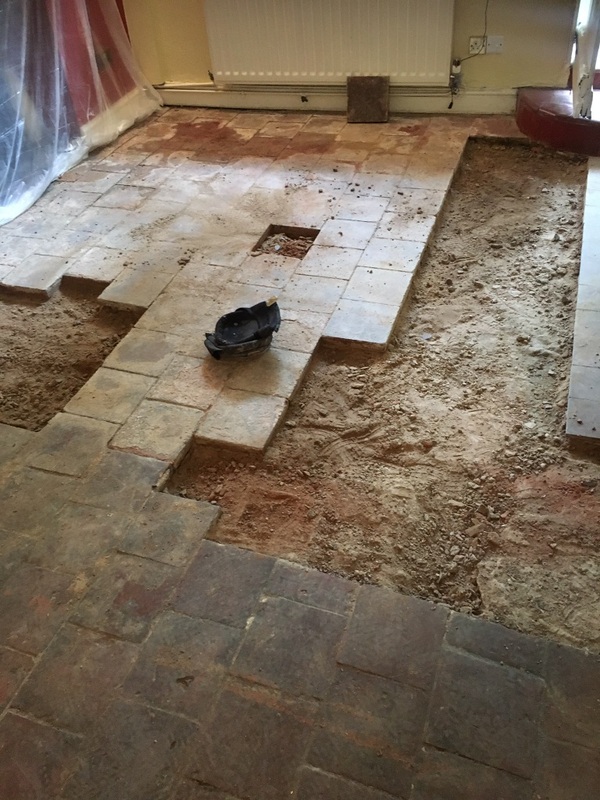 Upon doing so she and her partner discovered a large area of original Quarry tiles. 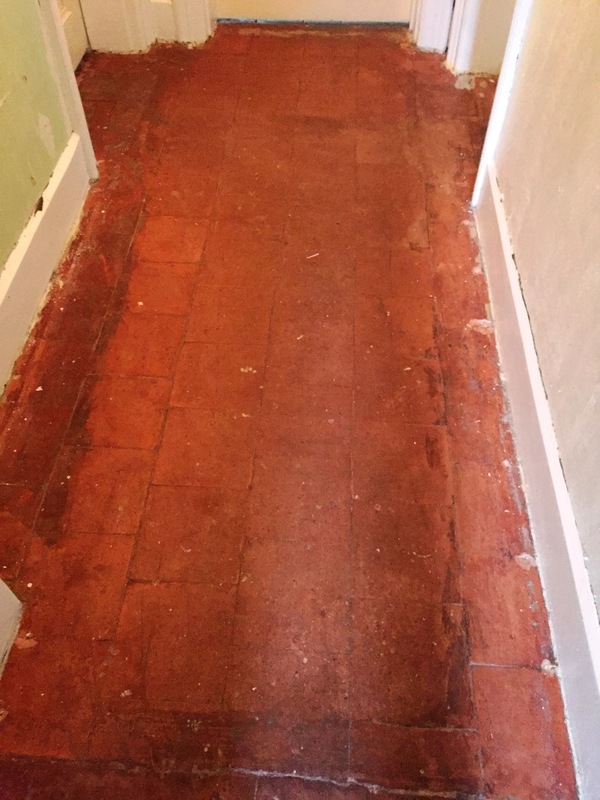 They decided that instead of replacing the carpet with a new one, they would keep the original floor and attempt to restore its condition. 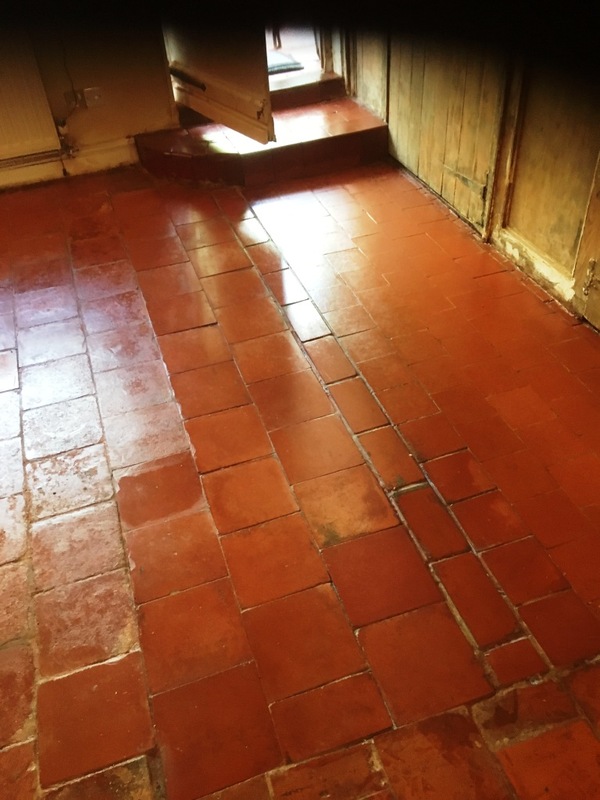 However, their efforts to restore the tiles by themselves proved ineffective – many of the cheaper, supermarket cleaning products were not suited for the job of removing years’ worth of dirt and stains. At that point they decided to call me. 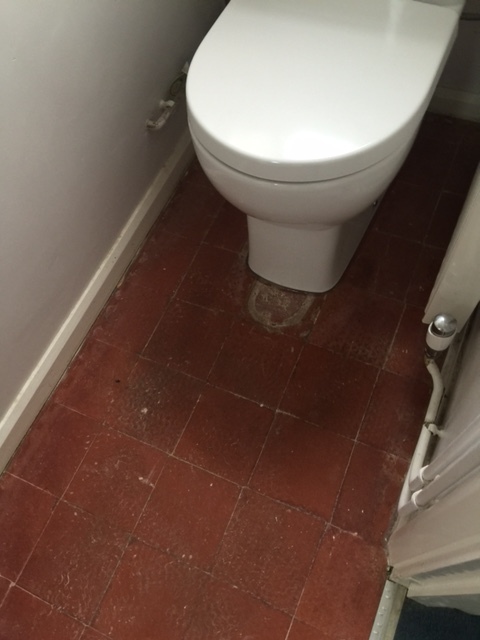 I visited the property and ran a test clean to see what could be achieved. The customer was more than happy with the initial results and booked me in to undertake the full restoration. 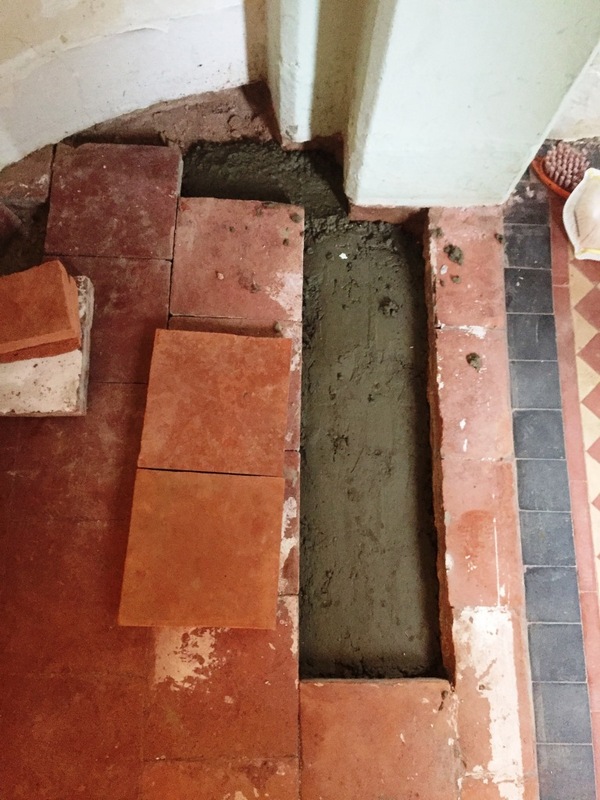 The most noticeable problem with the tiles was a series of paint splashes and plaster deposits covering almost the entirety of the floor, the result of previous decoration work and the installation of carpet. 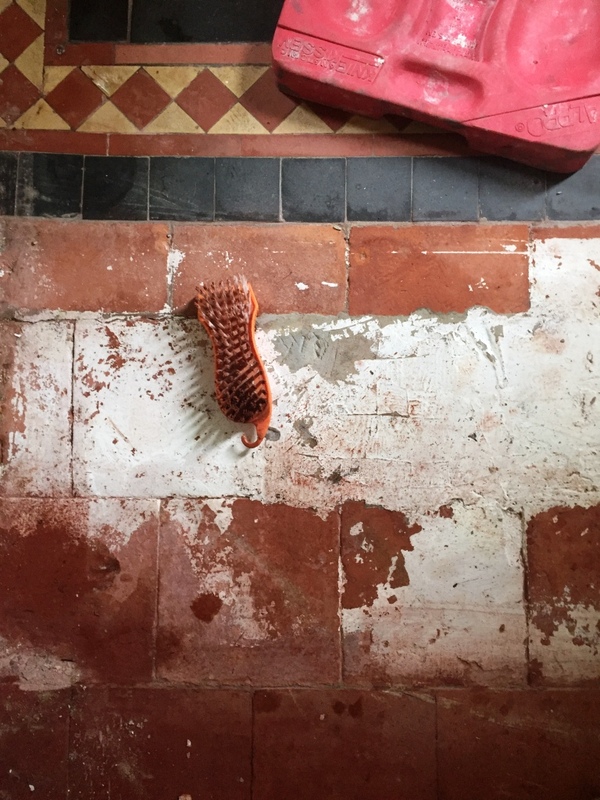 I removed these by applying a strong dilution of Tile Doctor Pro Clean and working it into the tiles using a scrubbing brush fitted to a rotary machine, with the alkaline cleaner reliably breaking down the stubborn paint splashes. I then worked the product into the grout lines too using a grout brush. 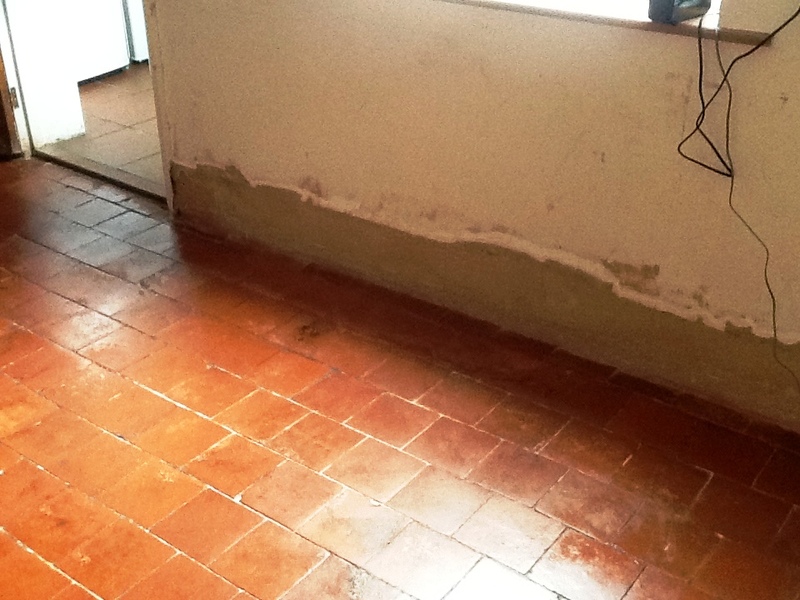 To tackle the plaster and cement-based residue I used Tile Doctor Grout Clean Up, a phosphoric acid cleaner which removes heavy stains. 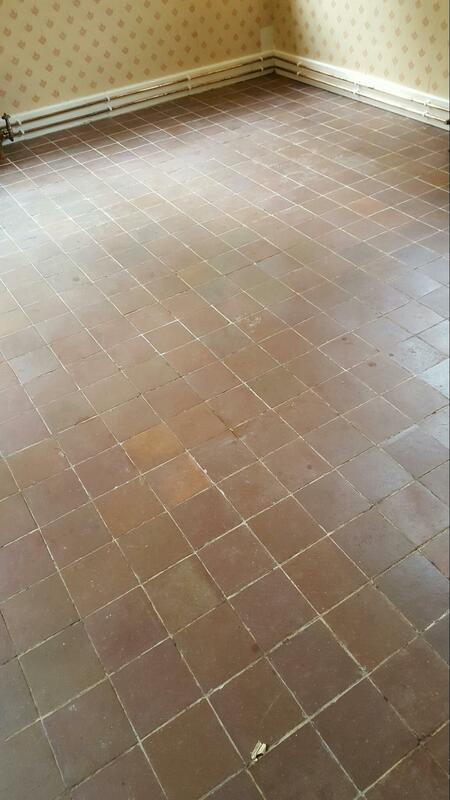 Following the cleaning, I left the floor to dry for a week to allow for any excess moisture to evaporate. 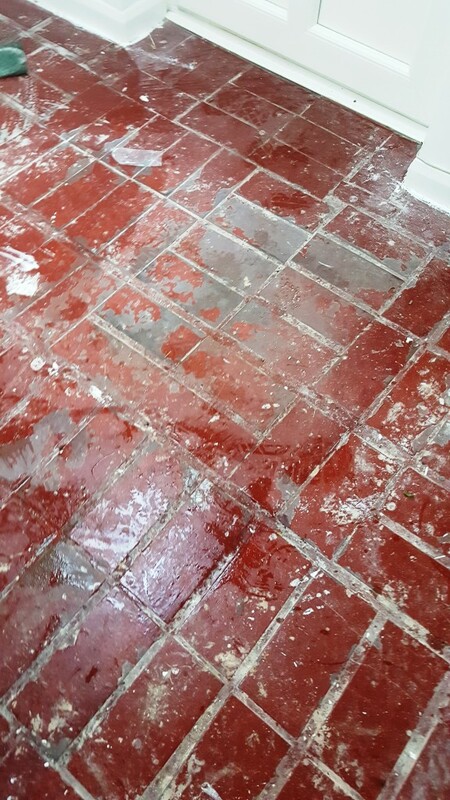 On my return to the property I immediately checked whether the floor was dry enough to be sealed. 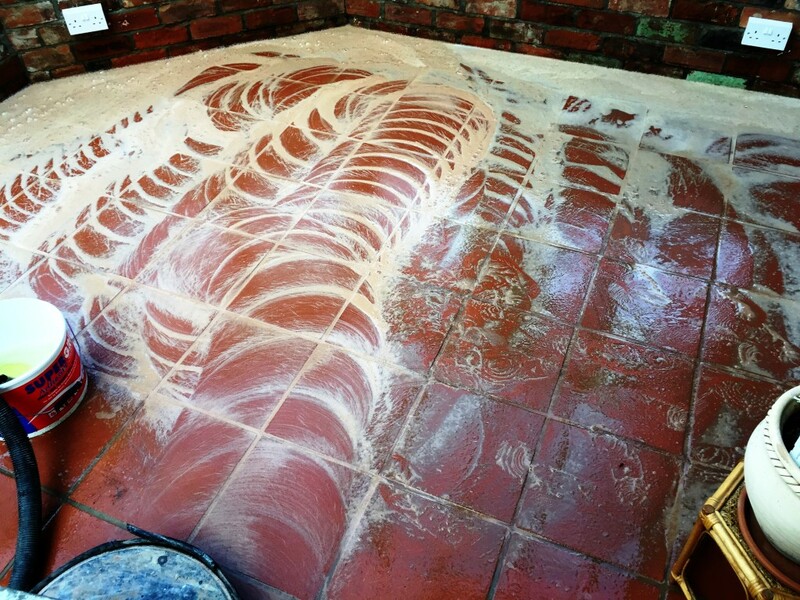 We always do this as excess moisture can very easily effect the performance of the sealer. 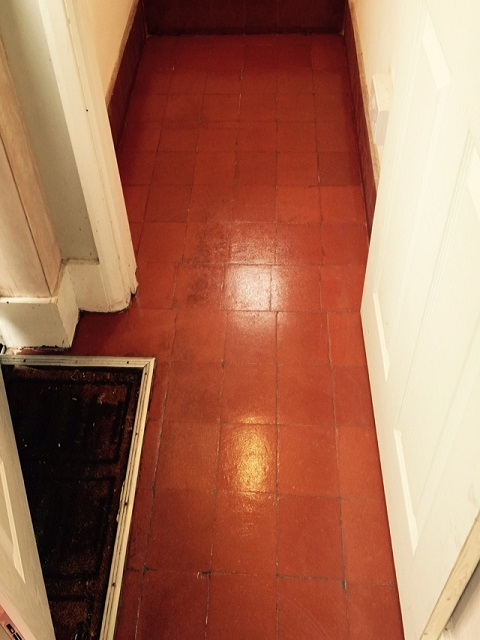 Thankfully the floor was completely dry and I was able to seal the tiles using five coats of Tile Doctor Seal & Go. 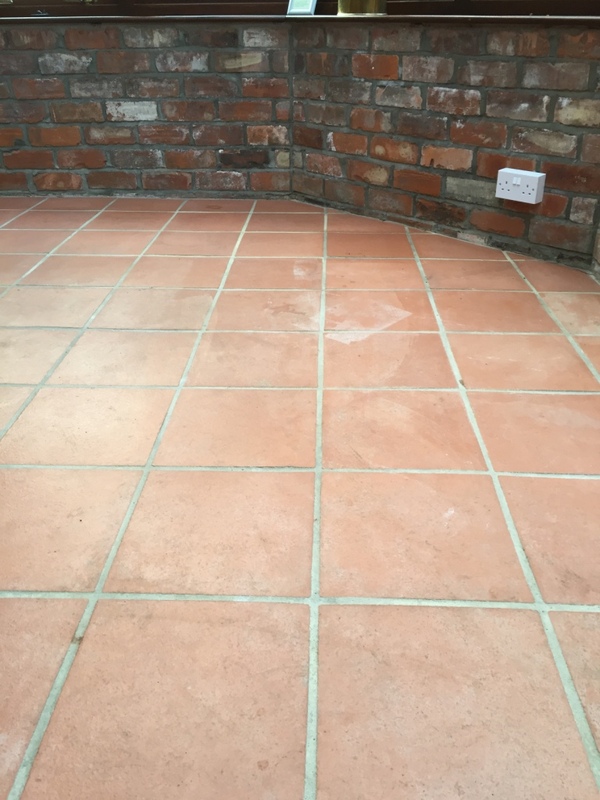 Seal & Go is a topical sealer, meaning it builds up a layer of protection again dirt and stains on the surface of the stone. 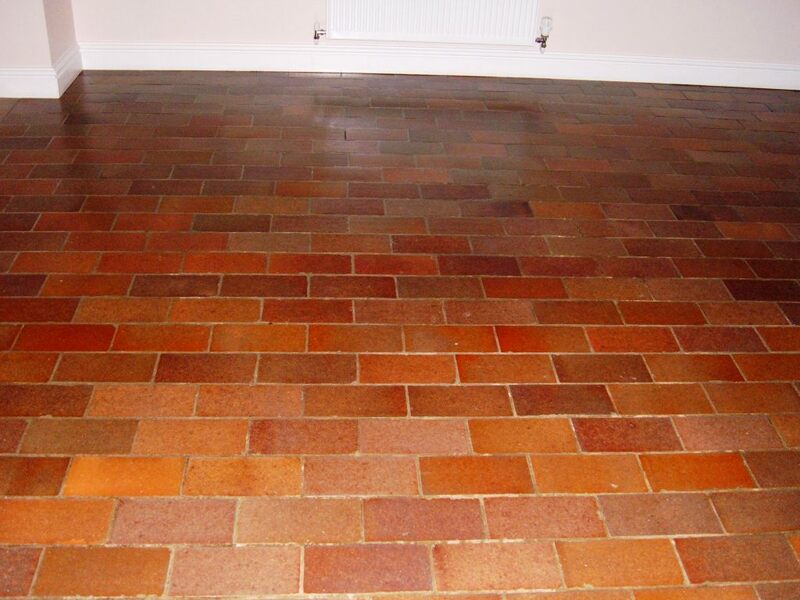 We recommend it for tiles such as Quarry, Victorian and Slate. While offering surface protection it also provides a pleasing low-sheen finish. The customer was really pleased with the result. 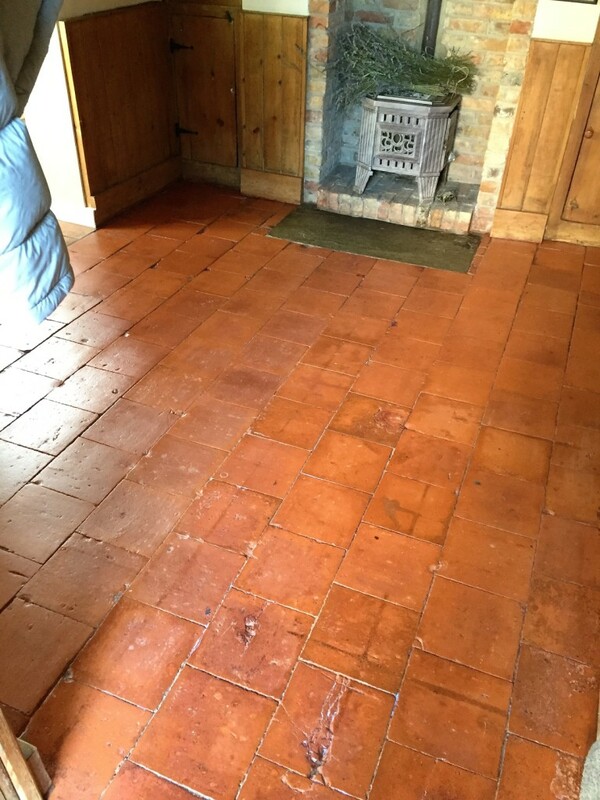 Within a week the newly discovered Quarry tiled floor had been transformed from an apparent lost cause to a real asset to the home of the new property owners. Flooding in the UK seems to have become more frequent and devastating in recent years, with areas such as Cumbria and Yorkshire being among those that have been particularly badly affected. Of course, flooding hits many homes directly, causing often irreparable damage and problems that can last for years following the incident. 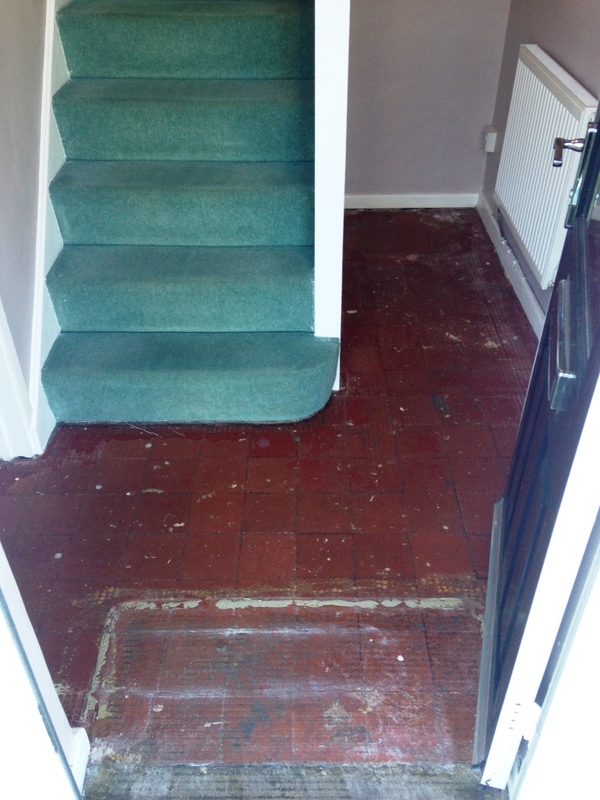 This property in Hessle had been damaged by the terrible flood that hit Hull in 2007. 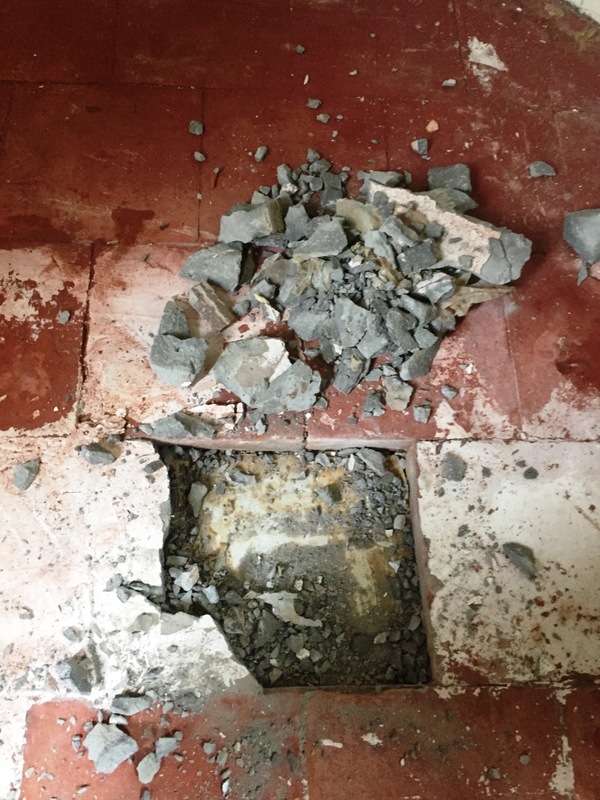 Nearly a decade on from the incident, the property’s Quarry tiled conservatory was still in a bad way, with what I believe to be salt deposits having built up on the surface of the floor. 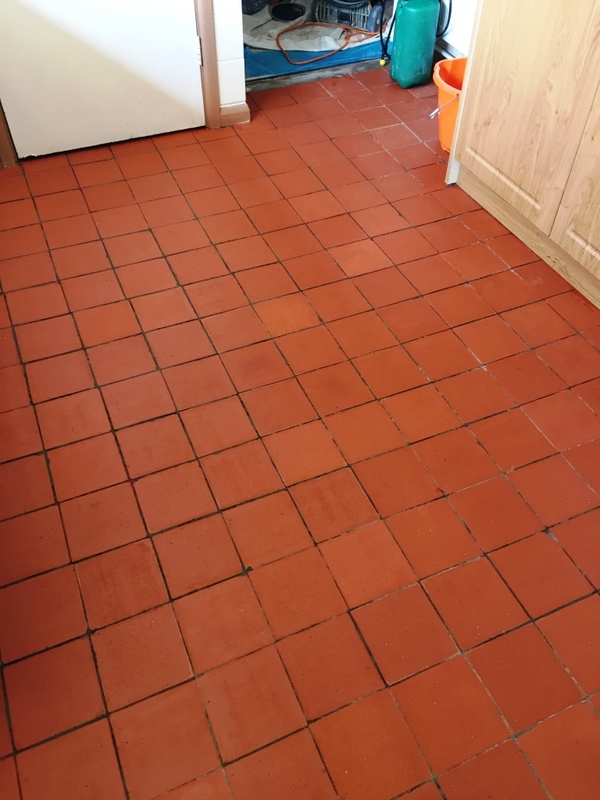 All in all, the floor had not fully recovered from the flooding, and was in need of a deep clean – both for the tile and the grout – and a fresh seal in order to be restored to its former glory. The property owner called me to the property to conduct some spot tests to determine the results that could be achieved. 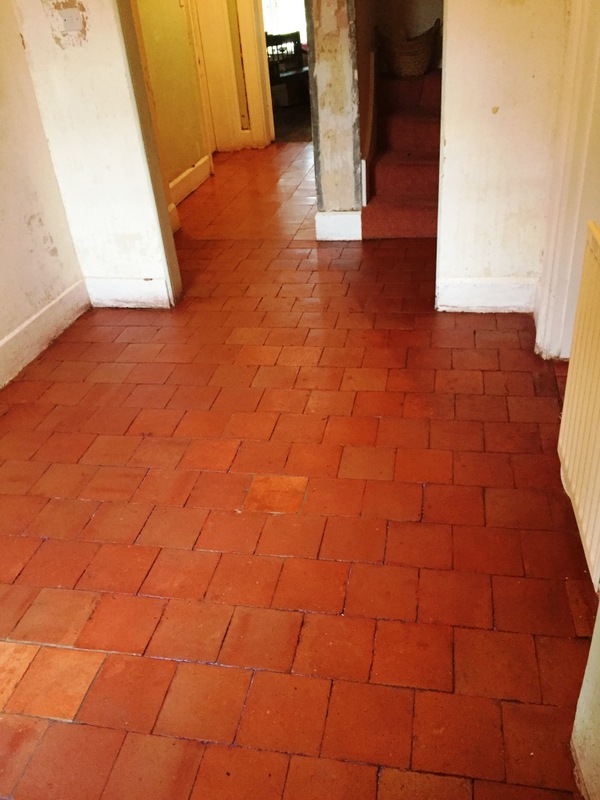 The results were very promising so we booked in the job and got to work on the restoration. 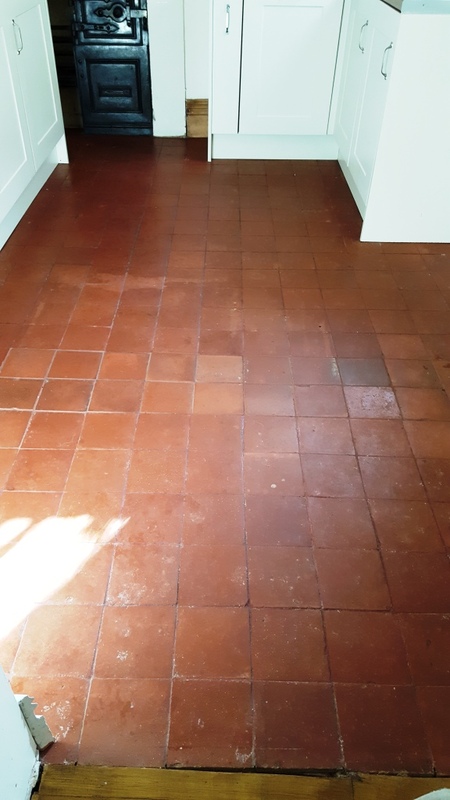 To begin the restoration, the floor was covered with Tile Doctor NanoTech HBU, a penetrating cleaner that utilise nano-sized cleaning particles, along with a small amount of Tile Doctor Remove and Go, a heavy duty remover used to break down old sealers, adhesives and paints. 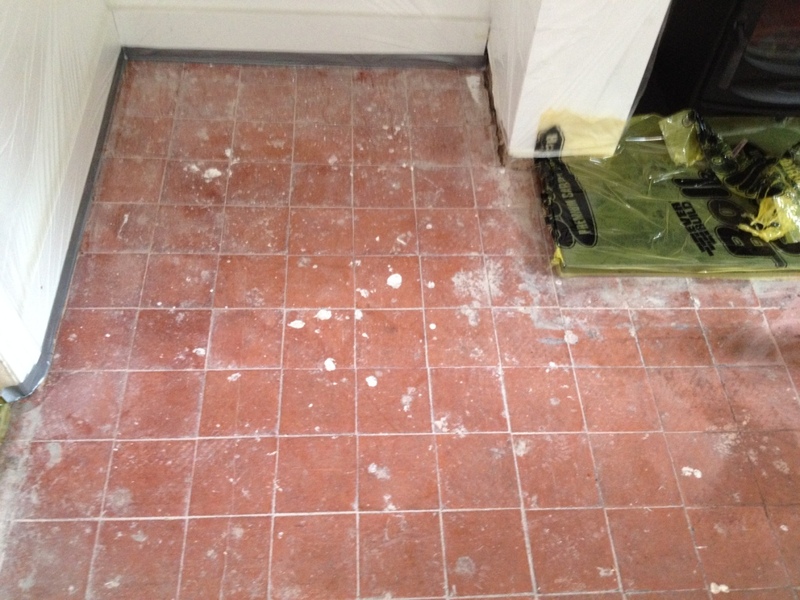 This solution was them scrubbed into the tiles using a 17” rotary machine and a black pad. It was left to dwell for around 15 – 20 mins to work its way into the pores of the stone, before being scrubbed again. 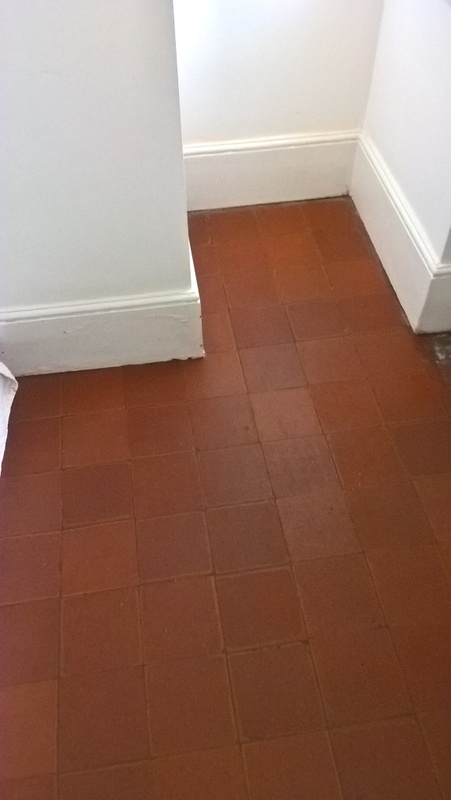 Given that the floor had not been treated to a proper clean in a long time, I repeated the process three times until happy that the tiles were in the best possible condition. 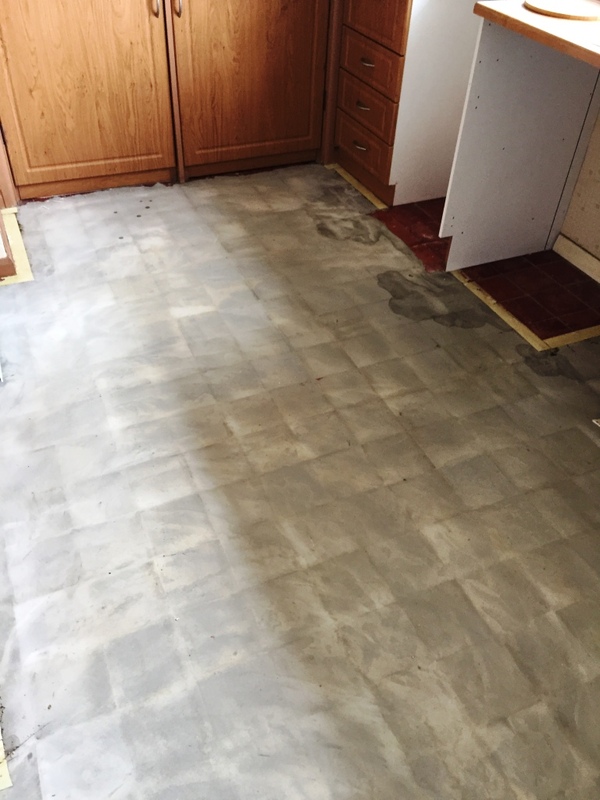 The second main part of the cleaning process involved rinsing the floor using Tile Doctor Grout Clean Up, which is an acid based product used to remove mineral deposits such as salt (also known as efflorescence) and grout smears. 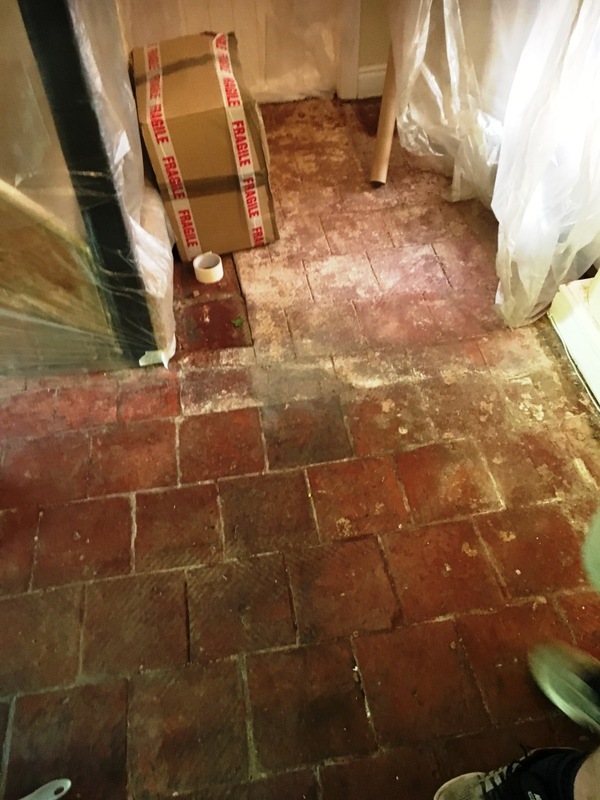 The floor was then given a thorough rinse to remove any trace of products and neutralise the floor before sealing, the floor was then dried as much as possible using a wet vacuum. 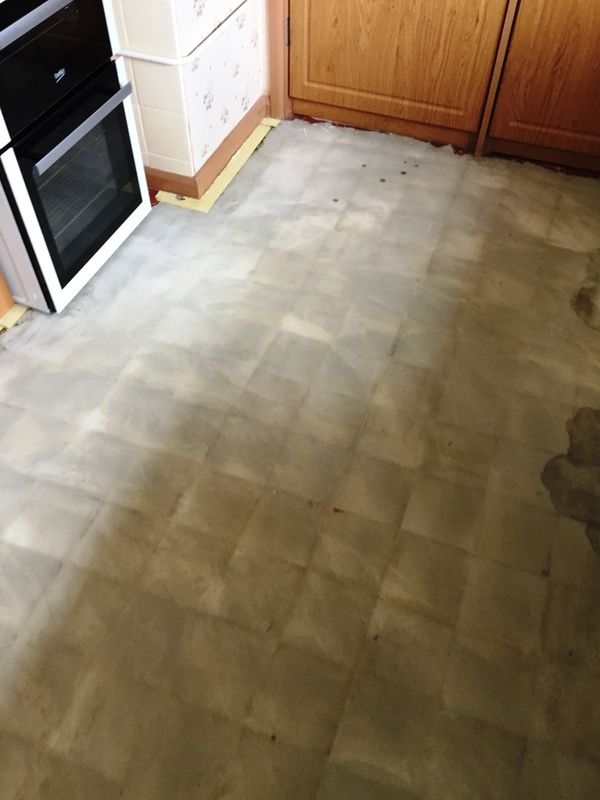 Following this very through clean, the floor was ready for sealing. However, I did have to leave the floor for a few days to dry fully, as any excess moisture can upset the sealer. 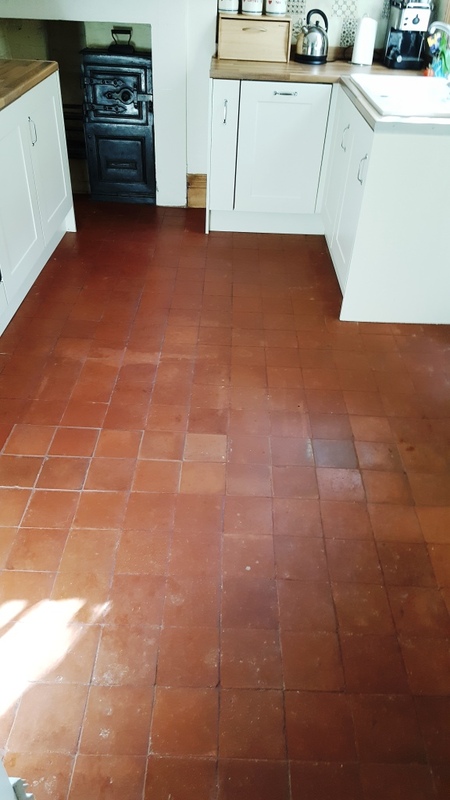 Upon my return I checked for dampness before proceeding to see the tiles using two coats of Tile Doctor Colour Grow, which is a penetrating, colour enhancing sealer. The sealer penetrates into the pores of the stone to fill them and protect it against ingrained dirt. The results were truly fantastic. 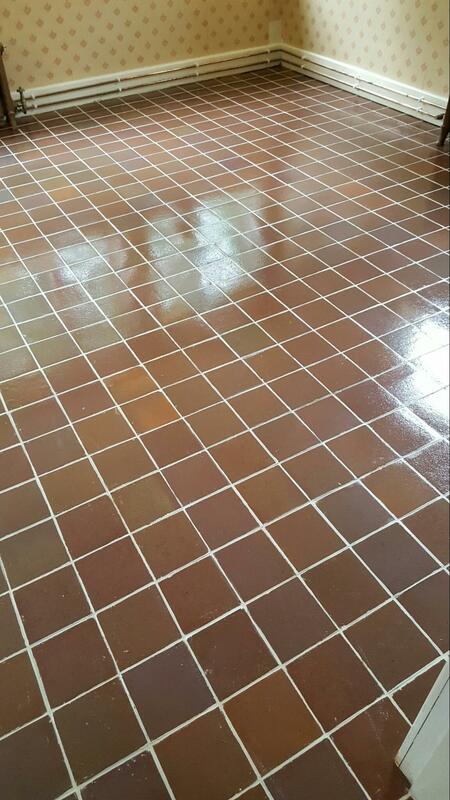 The combination of a deep clean and colour enhancing sealer left the floor looking brilliant. 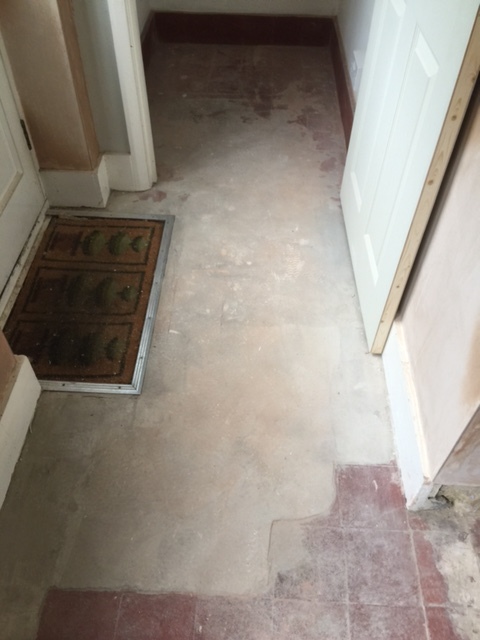 You wouldn’t have been able to tell that the floor had once suffered from severe flooding. Needless to say the customer was very satisfied. 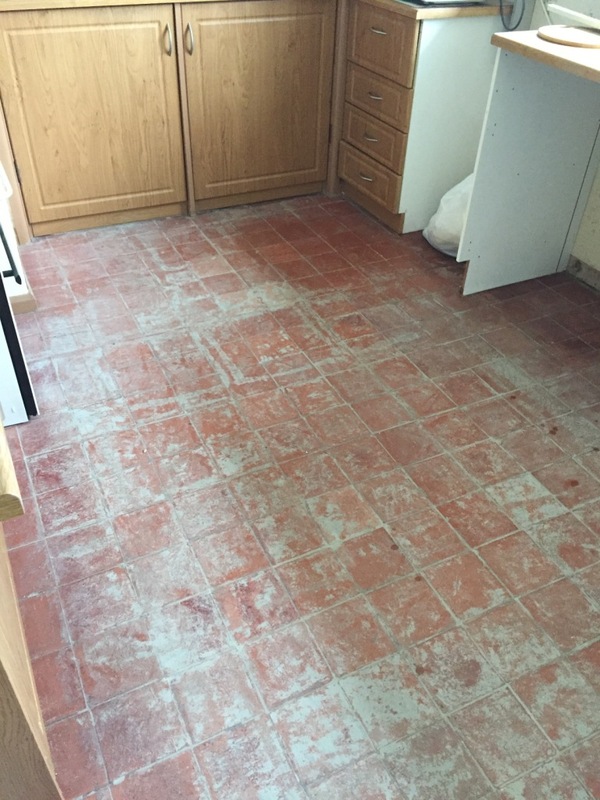 This Quarry tiled kitchen floor was in very good condition, with no cracked or broken tiles. 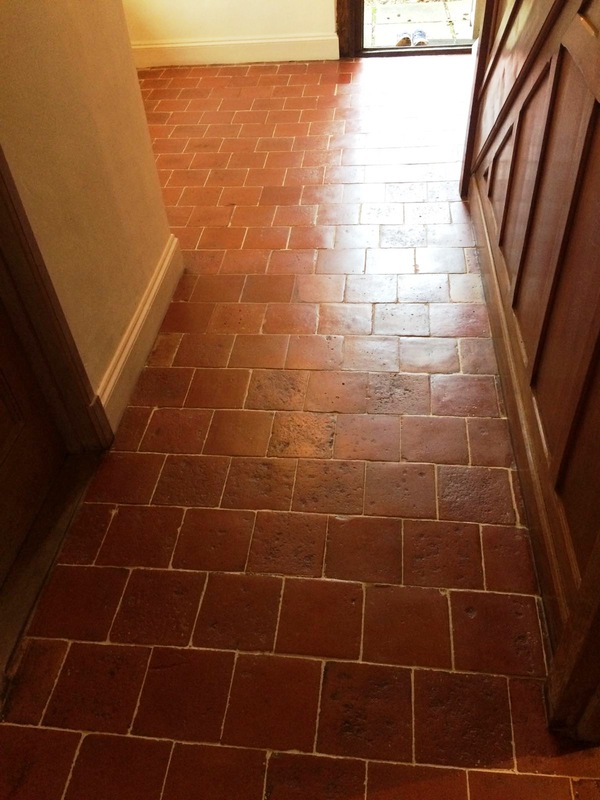 However, my customer, who lives in the town of Tutbury, near Burton-on-Trent, was keen to boost the condition of the tiles further through professional maintenance, including a deep clean and a fresh seal to restore the sheen to the Quarry. NB, did you know it’s estimated that Tutbury has actually been inhabited for 3000 years, having once been the site of an Iron Age hill fort, this house of course was a lot more recent. 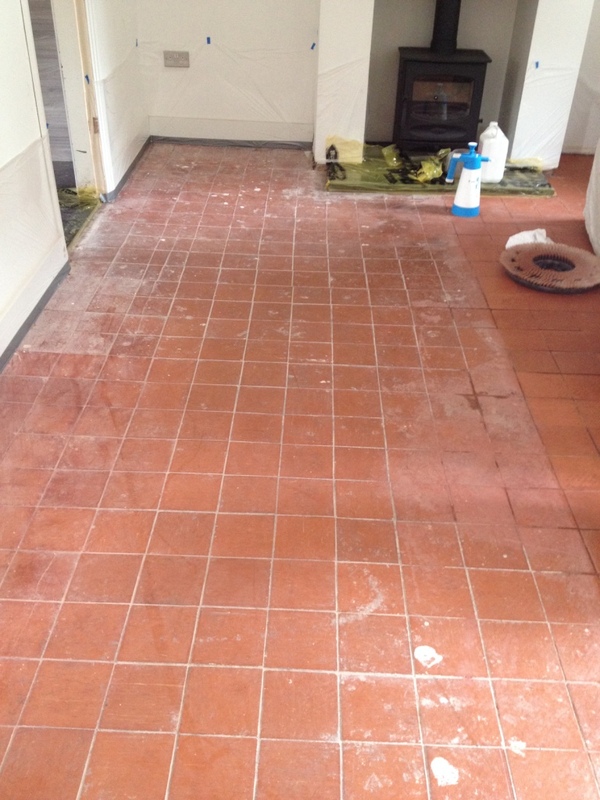 To clean the tiles, I chose to use our tried and trusted alkaline cleaner, Tile Doctor Pro Clean. 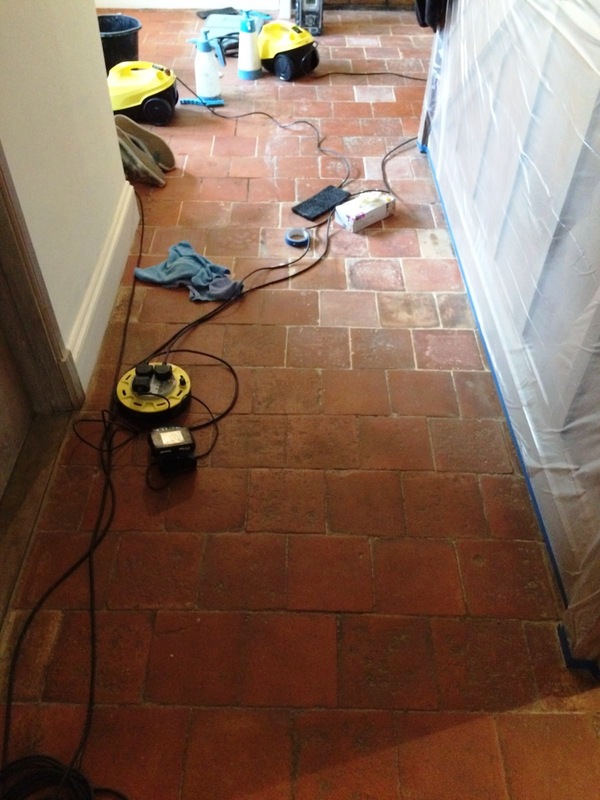 We use Pro Clean on most types of natural stone floor, including Quarry, Slate, and Victorian. 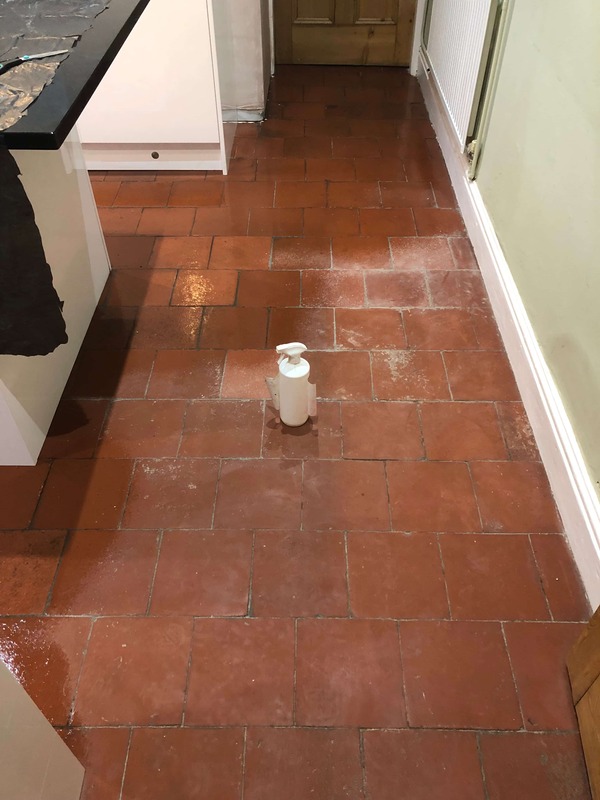 I applied Pro Clean liberally across the floor and left it to dwell for a short period, giving it time to seep into the tile to get underneath and lift out any ingrained dirt. The cleaner was then agitated using a scrubbing pad fitted to a rotary machine to remove the dirt and other general muck. 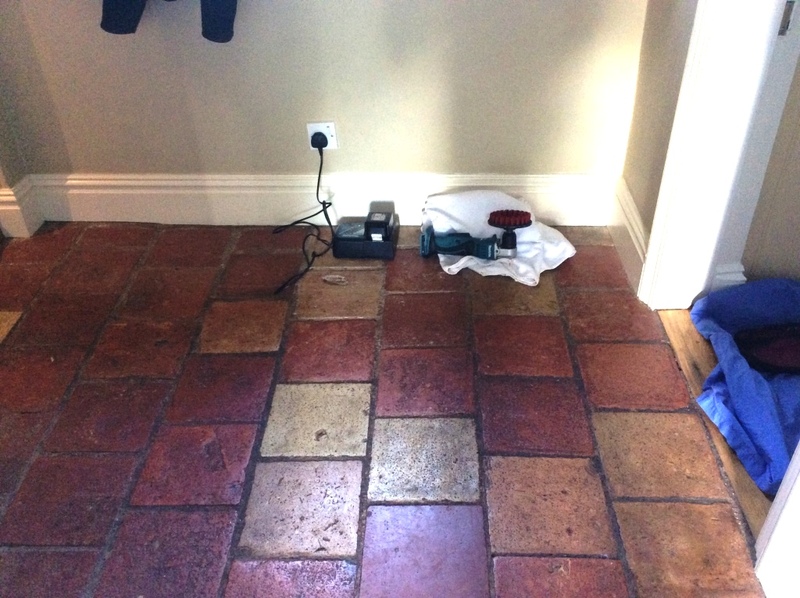 I then rinsed the floor with cold water and soaked up the resulting slurry with a wet-vac machine. 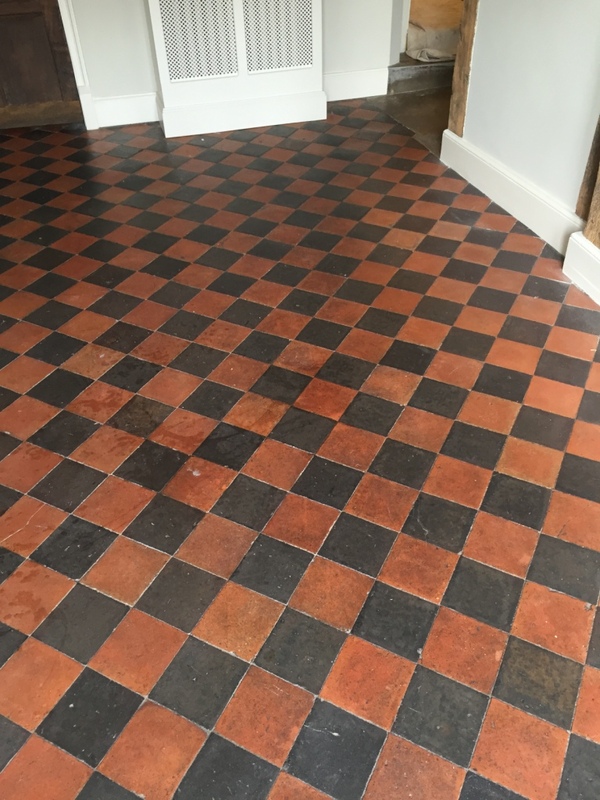 Some areas of the floor proved to be quite stubborn to clean, so in these areas the cleaning process was repeated until satisfactory results were achieved. Finally, the floor was given another rinse and left to dry off overnight. 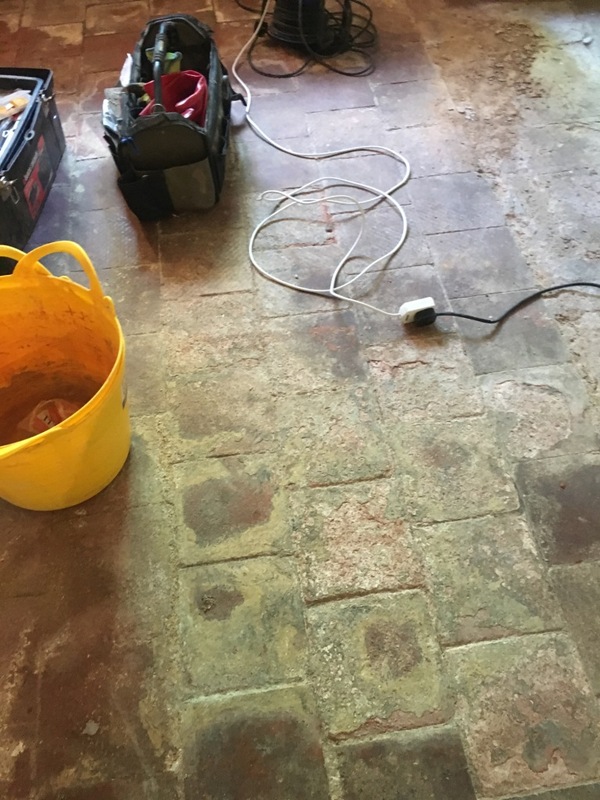 The next day I returned to the property and checked that the floor was ready to seal by running several damp tests, with the results indicating that was no excess moisture remaining on the tiles. 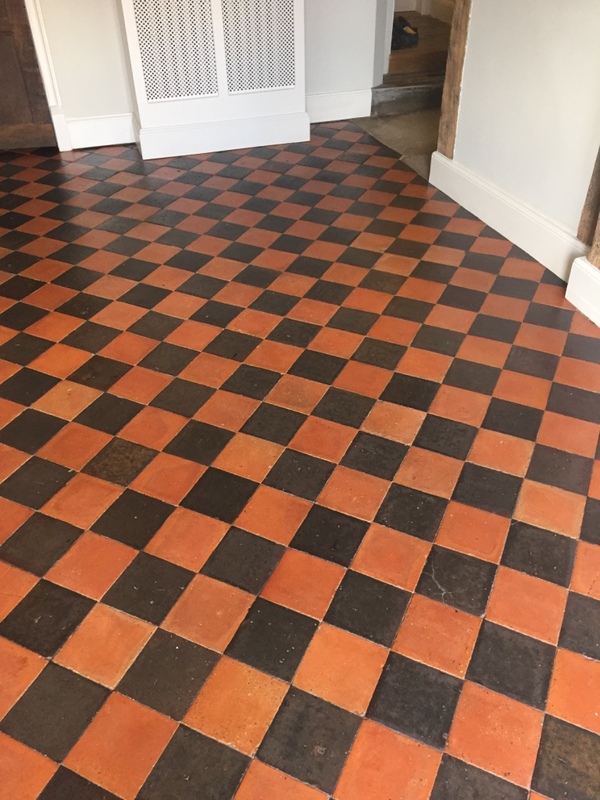 We carry out these tests before sealing because moisture can cloud the sealer and prevent it from properly protecting the tiles. 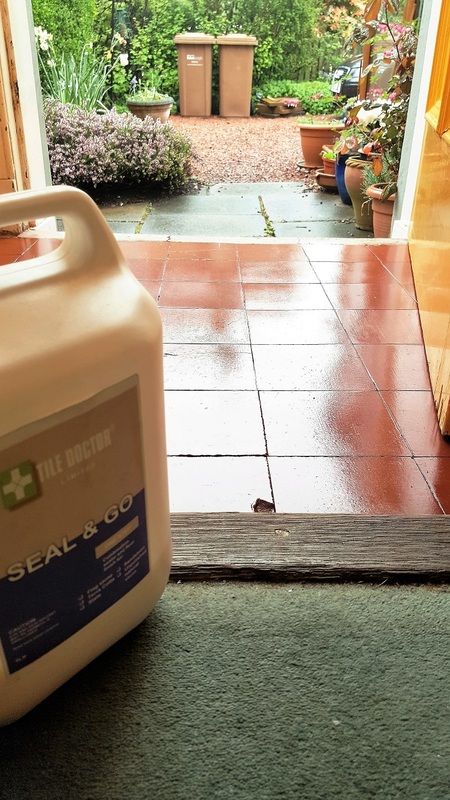 My choice of sealer was Tile Doctor Seal & Go, a cost effective topical sealer that builds up a robust layer of protection on the surface of the floor and provides a durable sheen finish that, as you can see from the photographs, really lifts the appearance of the tiles. 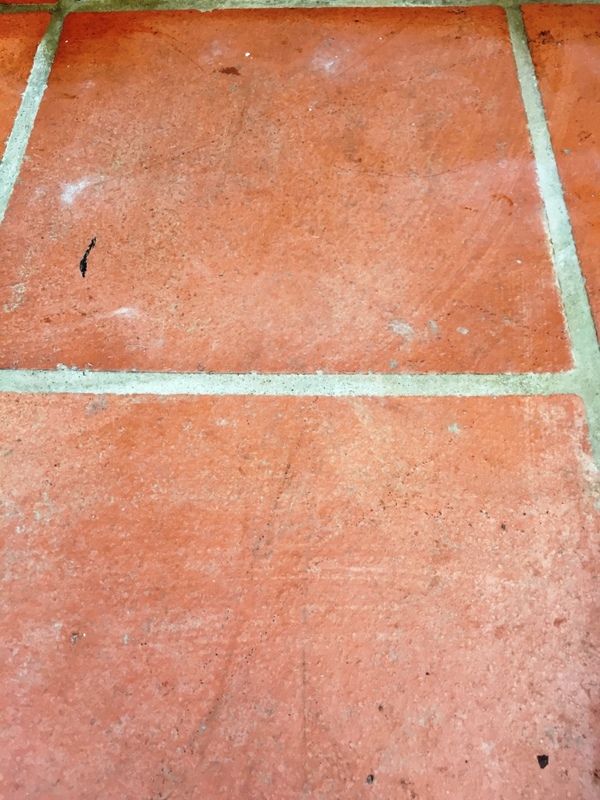 It’s a fact that any sealed tiled floor will need to be regularly maintained as sealers do wear off over time, especially in the high traffic areas, and this is when the floor starts to lose its appearance as dirt becomes trapped in the pores of the stone. 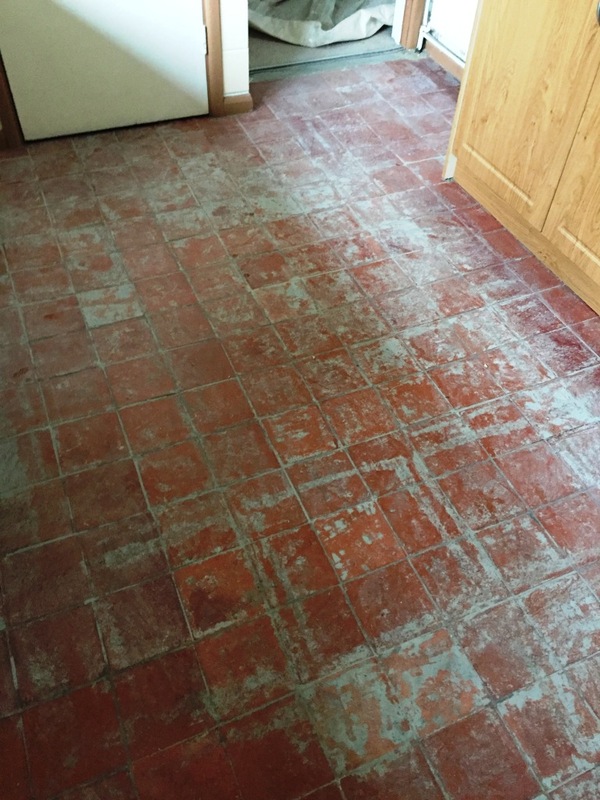 The life of the sealer can be extended however by ensuring you only clean the floor with a PH Neutral cleaner. 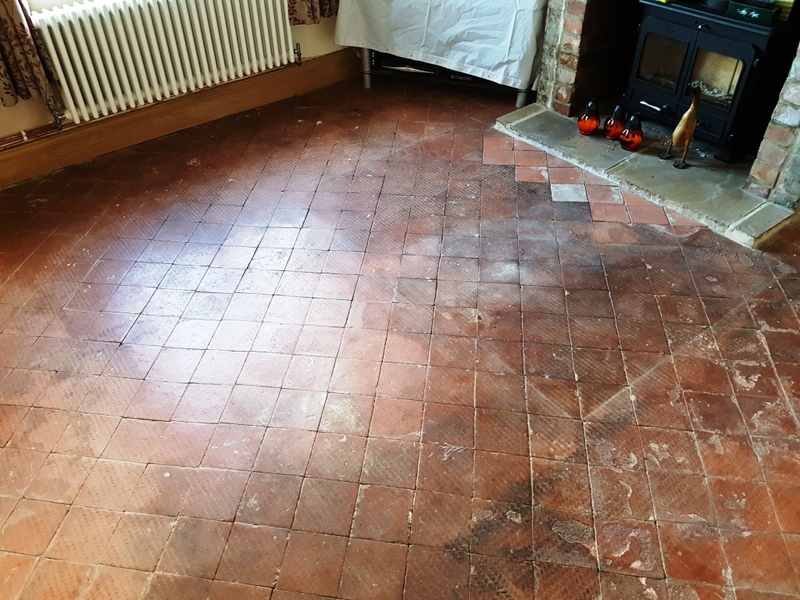 If you’re a first time buyer in the process of renovating or redecorating your new property, you may well discover some fantastic tiled floors hidden under your carpets. 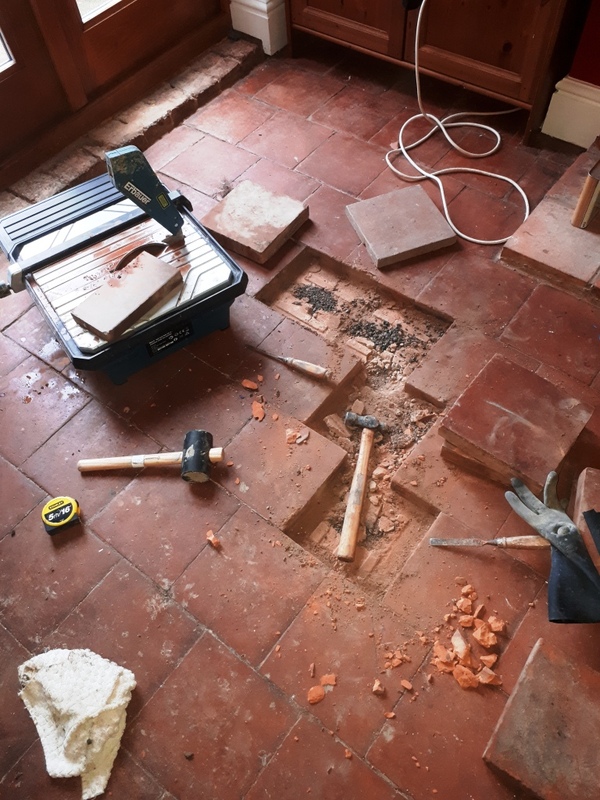 Certainly in my experience this happens quite often, so it came as no surprise when I got a call from a couple who had pulled up the carpet in the kitchen of their new house in Chester to find Quarry tiles, along with some fantastic Victorian tiles in the hallway. 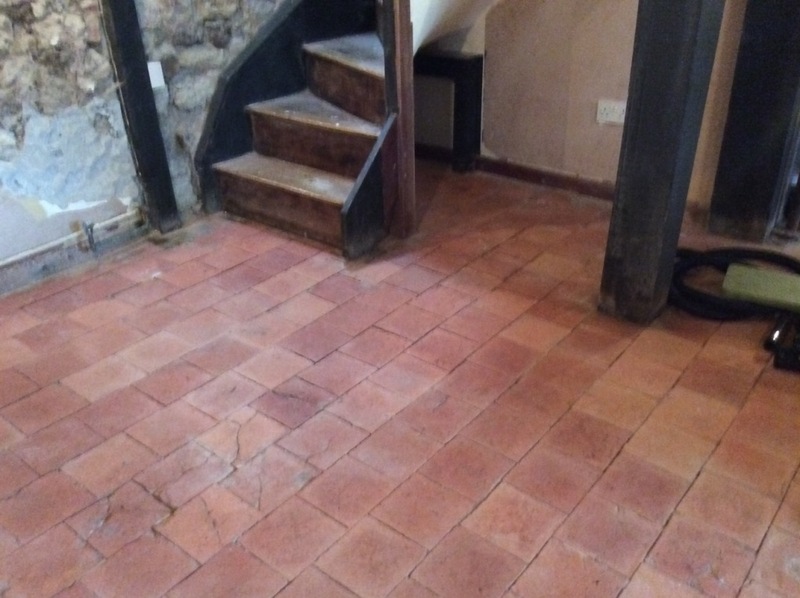 While the Quarry tiles were in relatively good condition – having been shielded by carpet for many years – the couple were still understandably keen to get them back to looking their very best. I was more than happy to help them do just that. Before beginning the restoration, I removed the kick boards from the kitchen cupboards so as not to damage them. 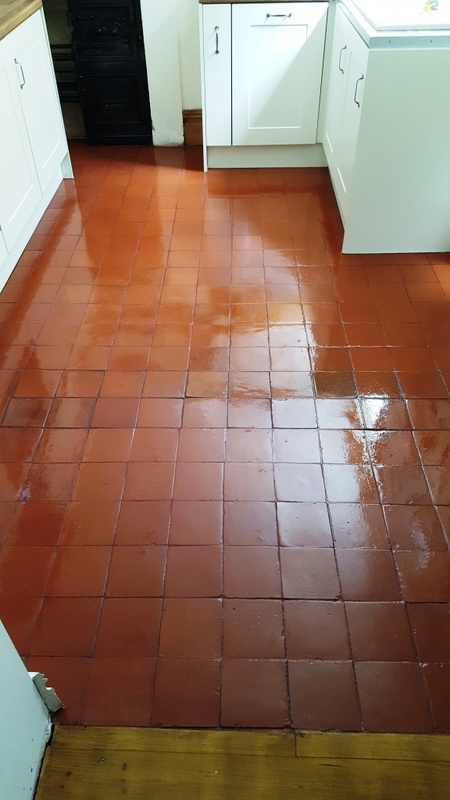 I then applied a solution of our versatile, high alkaline cleaner, Tile Doctor Pro Clean, and let it soak into the tiles for a short period before scrubbing it in using a rotary machine fitted with a black scrubbing pad. 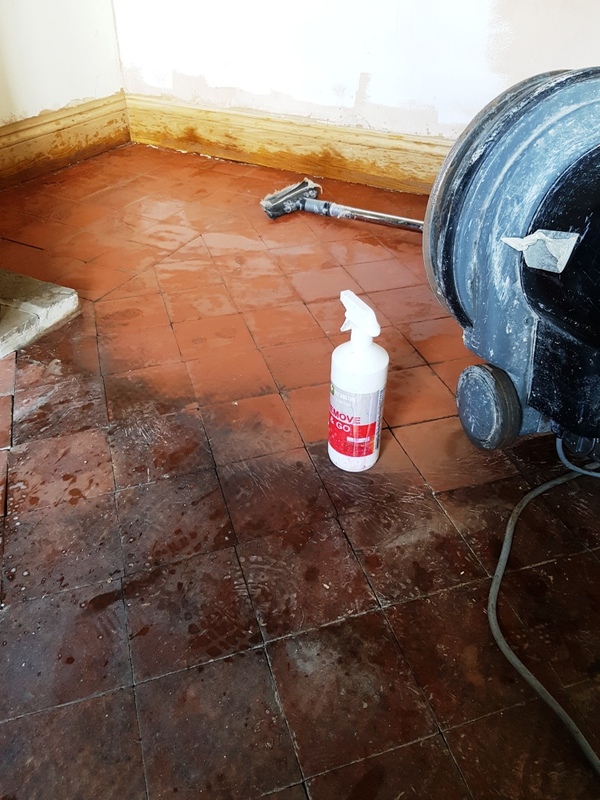 Pro Clean is suitable for use on most natural stone tiles, including Quarry, Victorian and Slate, doing the trick to break down medium to heavy soil buildup. 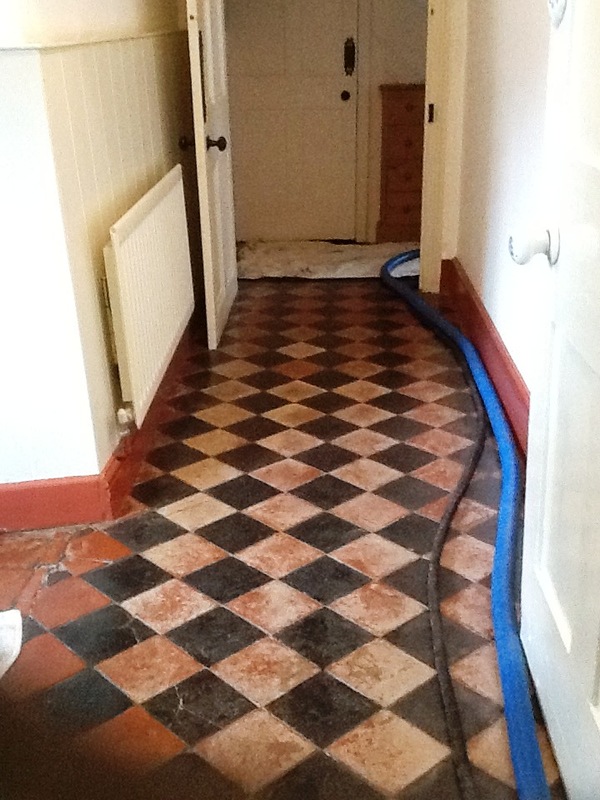 The floor was then rinsed off with clean water, and the resulting slurry was promptly removed using a wet vac. I then left the floor dry out overnight. 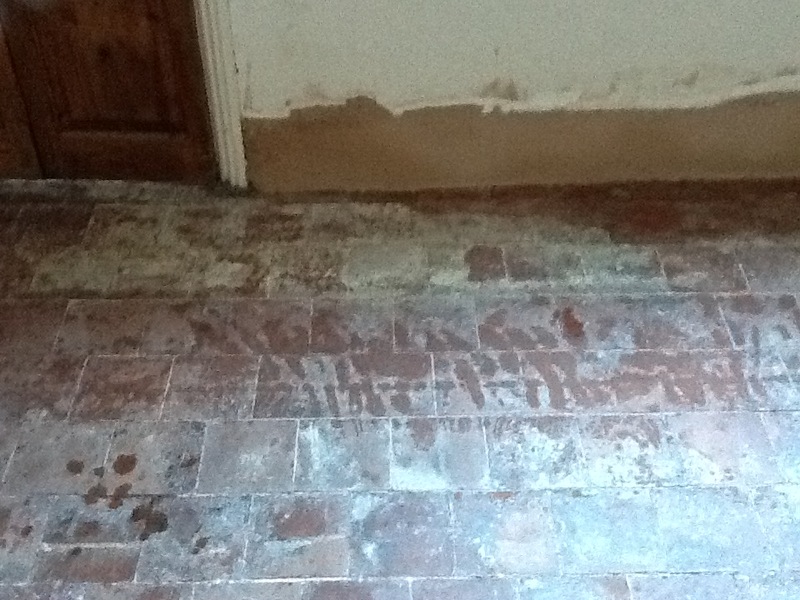 I returned to the property the next morning, and started out by taking a couple of damp meter readings to make sure the floor was dry enough to seal. 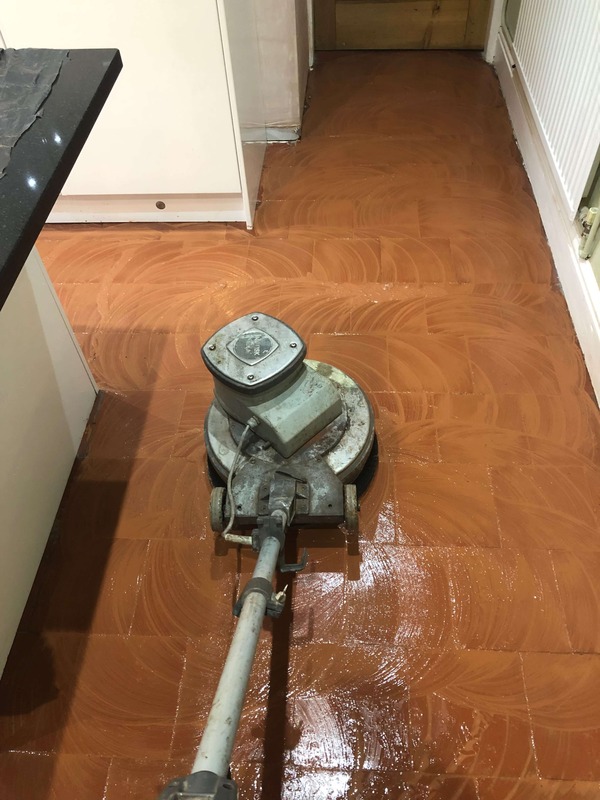 This is an essential task before sealing any tiled floor as even the smallest amount of excess moisture can cloud the sealer and damage its performance. 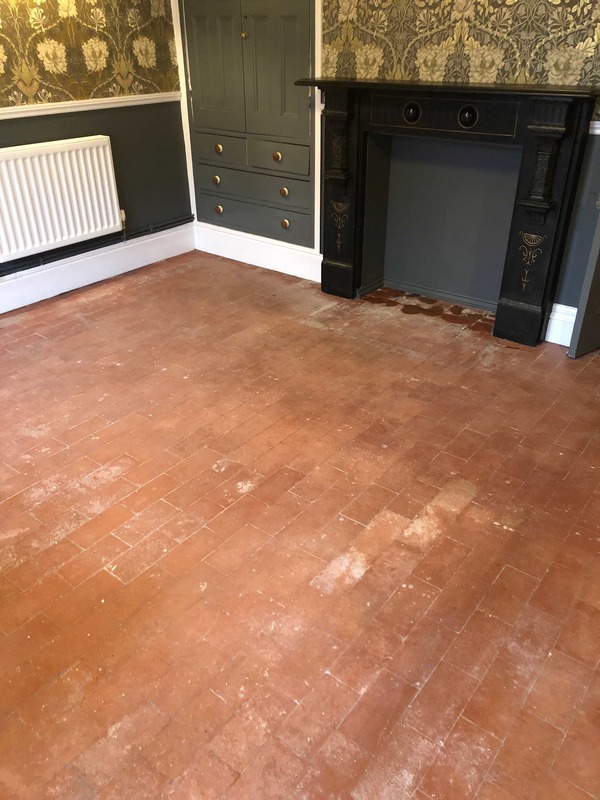 To seal the floor, I firstly applied one coat of Tile Doctor Colour Grow, which really brought out the natural reddish shades in the Quarry. 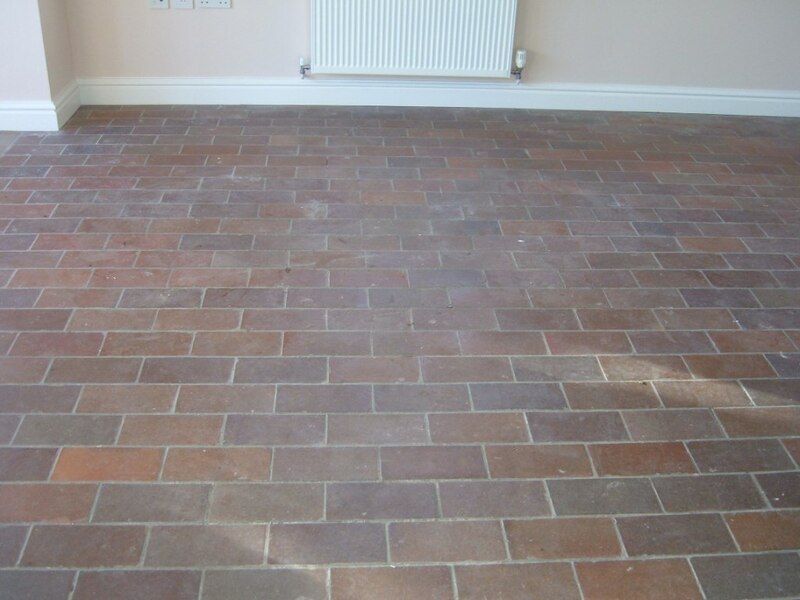 As an impregnating sealer, Colour Colour fills the pores in the stone and prevents dirt from becoming ingrained. 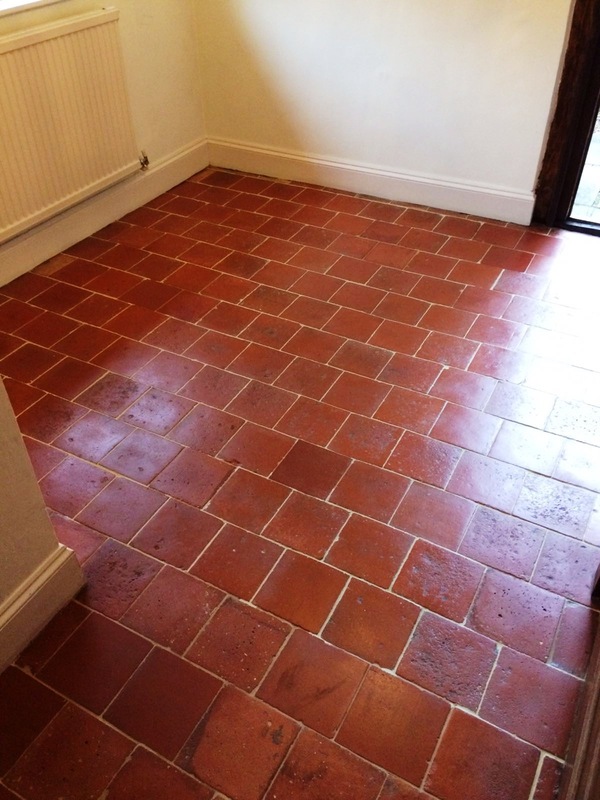 I followed the application of Colour Grow by applying three coats of Tile Doctor Seal and Go Extra. 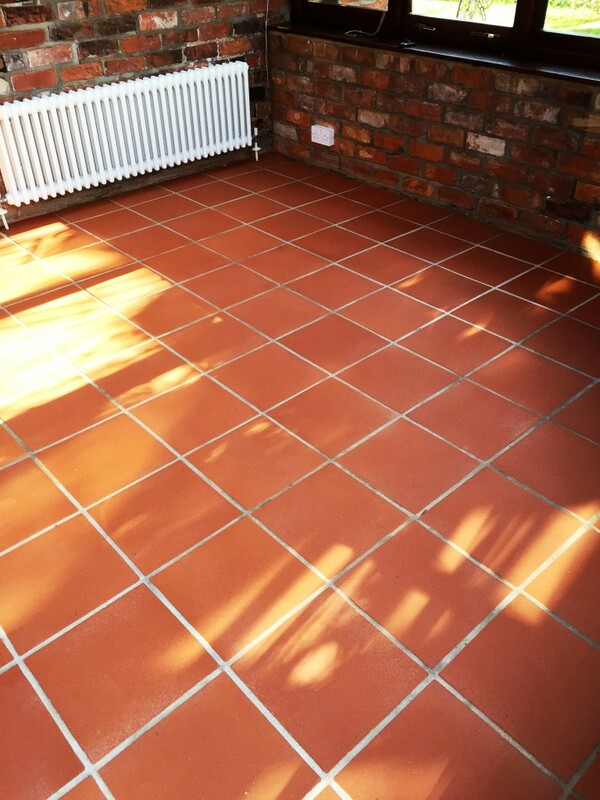 As a topical sealer, Seal and Go Extra forms an additional stain resistant seal on the surface of the tiles to protect against dirt and stains. 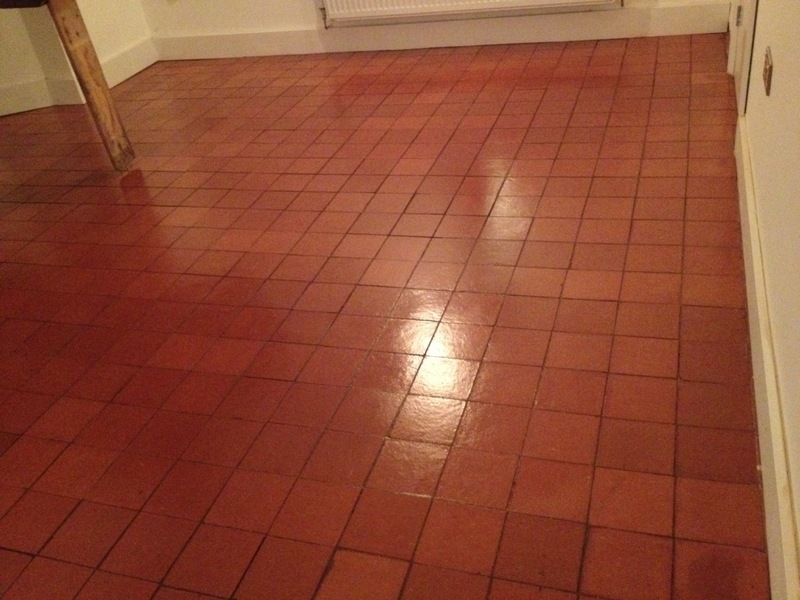 It also gave the tiles a quality sheen finish as requested by the customer. 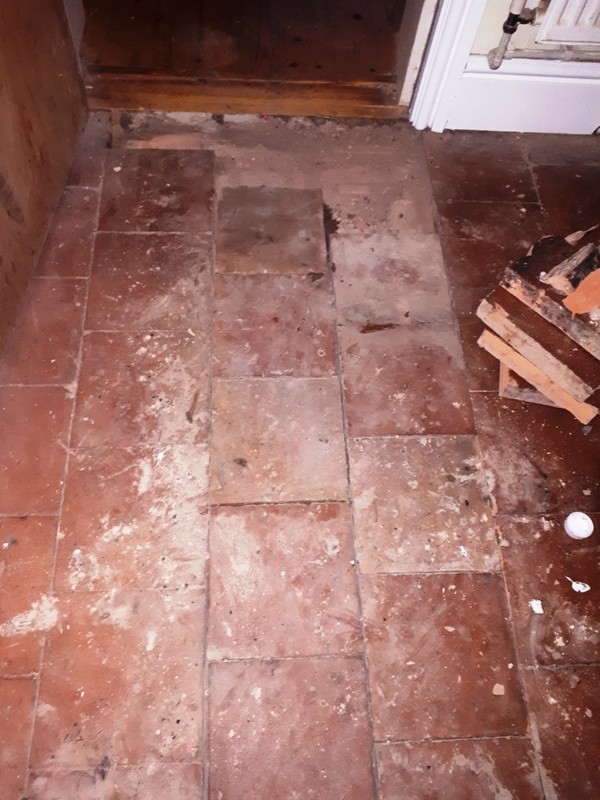 When you have a Quarry tiled floor like this one that is well over a century old, it’s inevitably going to have developed a number of problems over the years and be in need of some TLC. 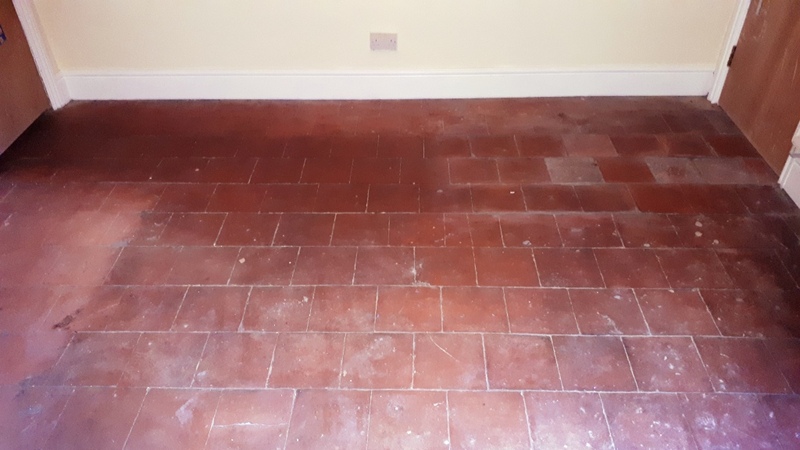 The floor, located at a property in the East Yorkshire town of Market Weighton, had been laid on a bed of sand and had no damp proof membrane which isn’t surprising for a floor of this age as a DPM didn’t really become standard until the 1960’s. 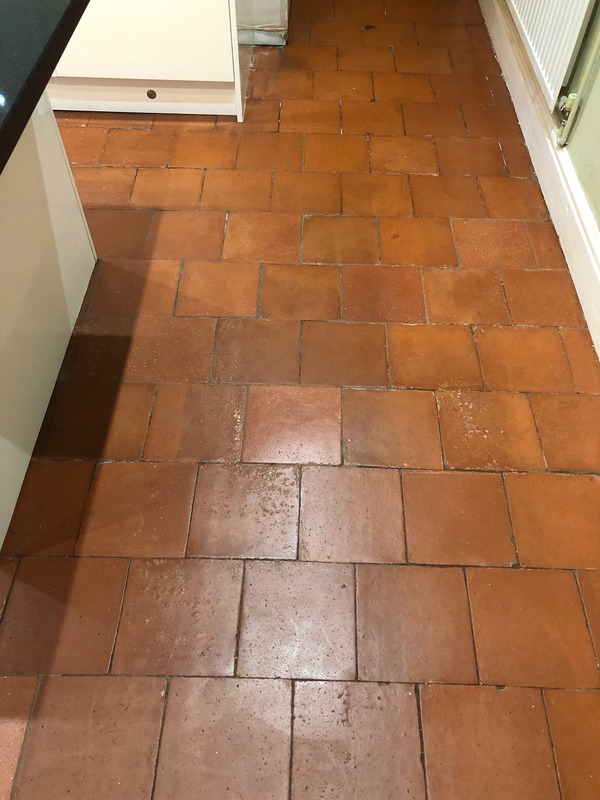 The customer was primarily interested in getting the tiles as clean as possible however I knew from past experience that floors in these circumstances can be particularly difficult to restore. Adding to this was the fact that the floor itself wasn’t in great shape to begin with, with numerous cracks and missing parts across the entire area. 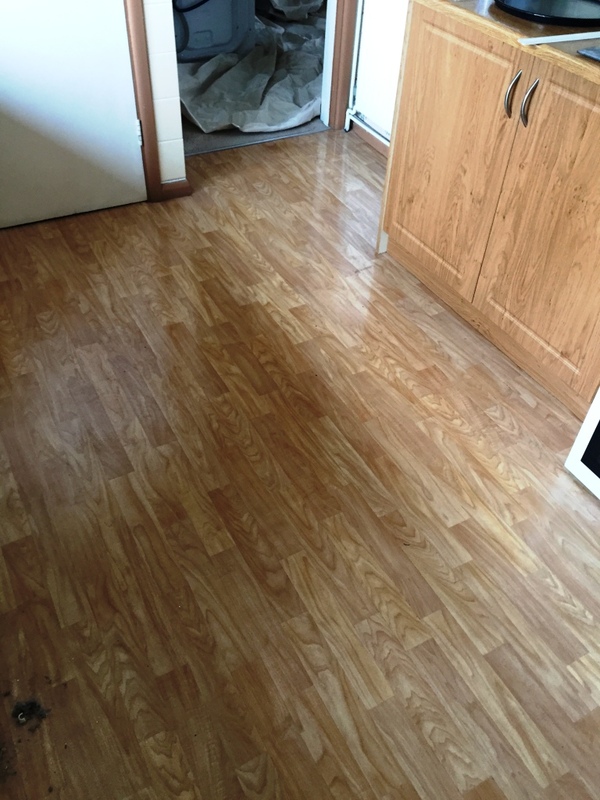 I ran a test clean on a small area of the floor to show the customer the potential results and, while I explained to her that this would be a very testing job, she said she would be happy with whatever improvements could be made. 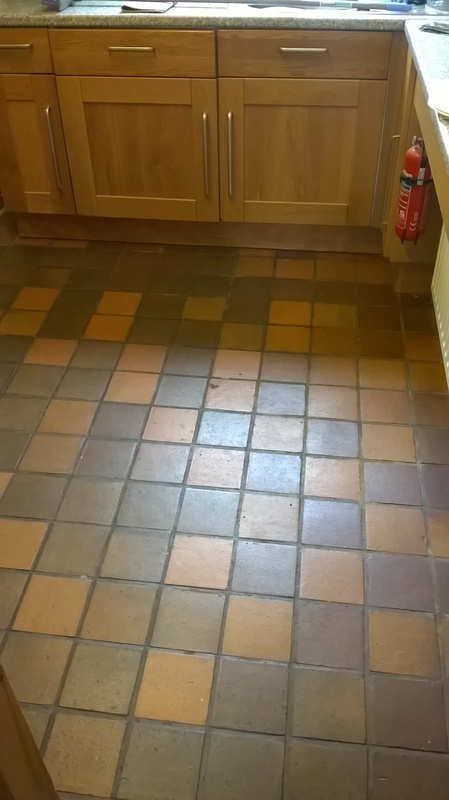 To clean this floor, I needed to use a strong cleaning solution consisting of half Tile Doctor Remove and Go and half Tile Doctor NanoTech HBU. 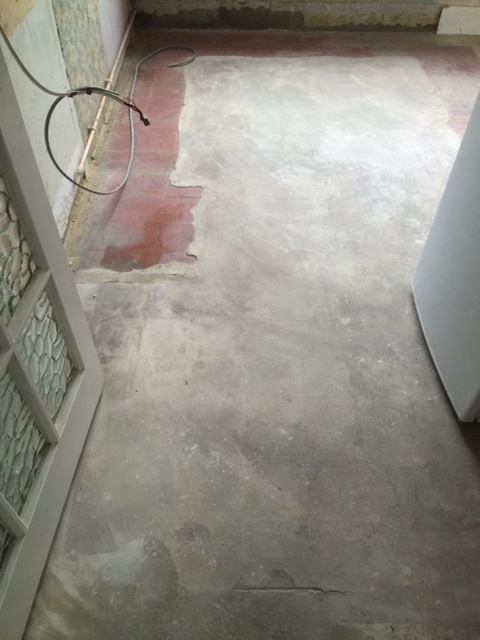 Remove and Go works to break down any existing sealer and heavy soil buildup on the surface of the floor. NanoTech HBU takes the cleaning process a step further, utilising nano-sized particles to penetrate into the stone and dissolve difficult-to-reach ingrained dirt. 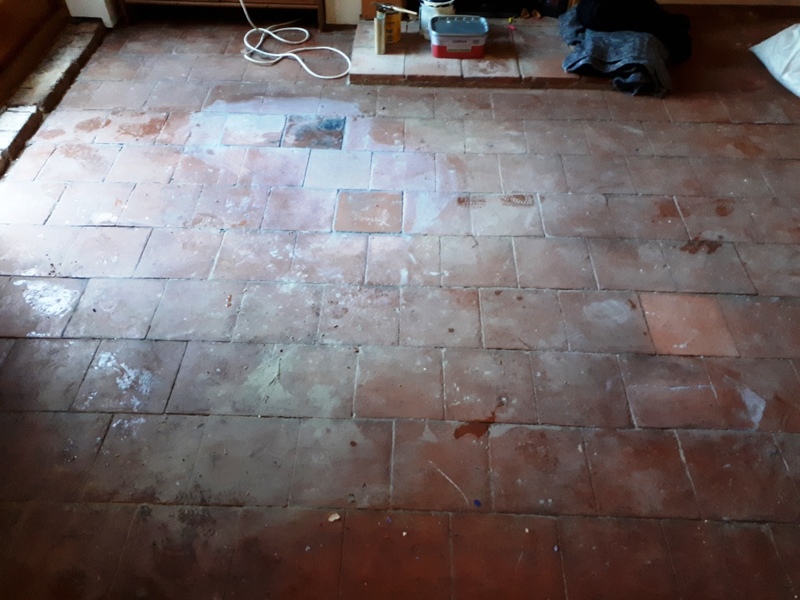 Once applied for the floor the solution was left to dwell for 10-20 minutes before I scrubbed it into tiles using a scrubbing pad fitted to a rotary machine. 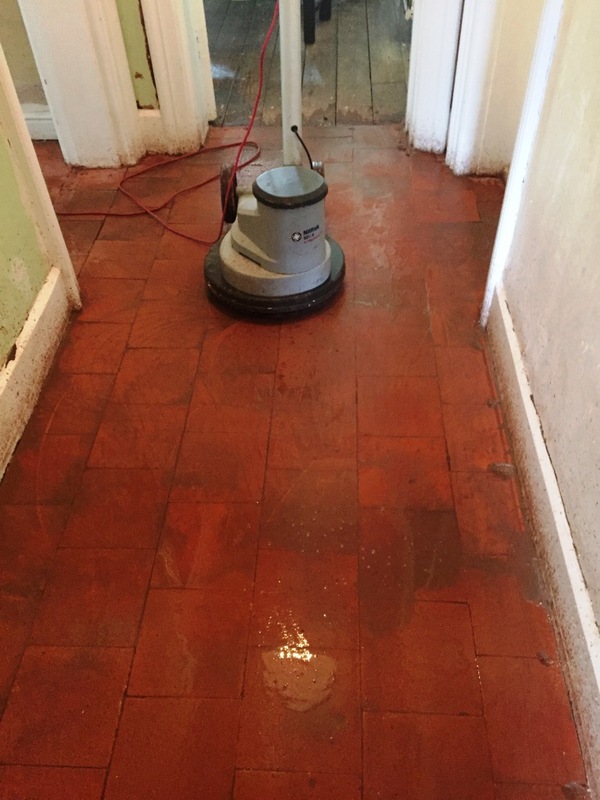 The resulting cleaning slurry was promptly removed with a wet-vax machine. 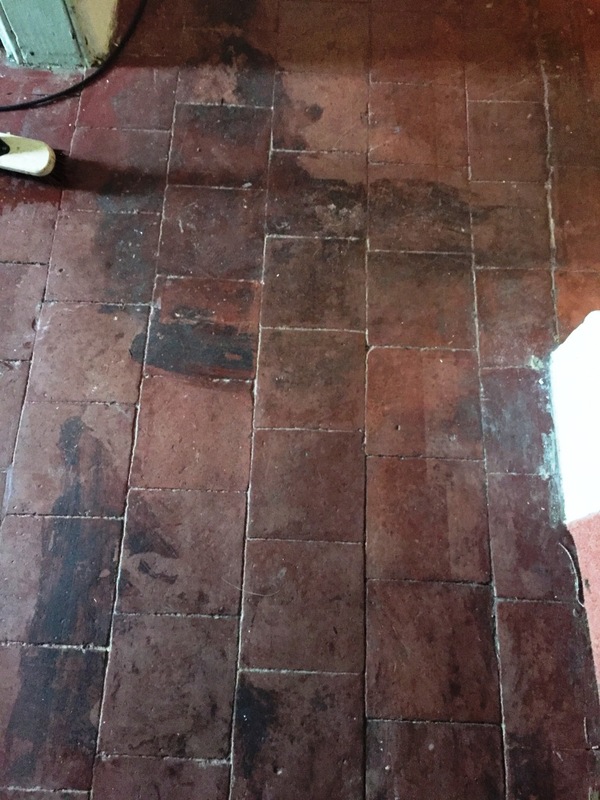 Since the old floor was in a particularly bad state I resolved to repeat the cleaning process three times, followed by further spot cleaning for particularly stubborn areas. As the tiles were very uneven in parts I found a lot of easily missable areas that needed special cleaning attention by hand. 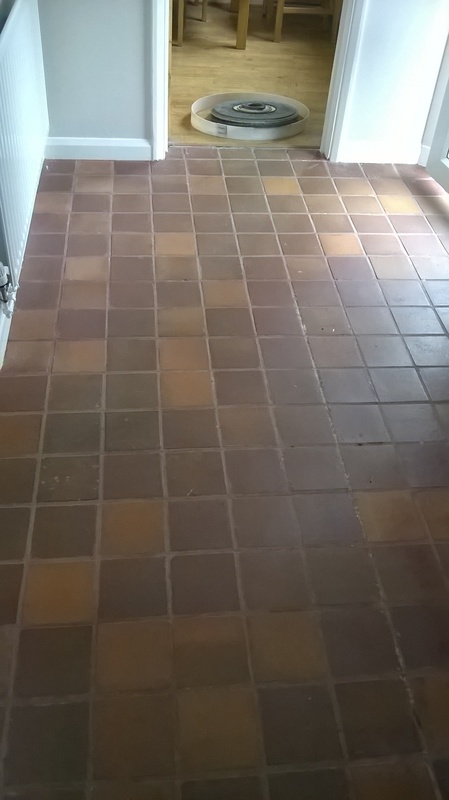 When I was satisfied with the results of the clean I neutralised the leftover chemicals using Tile a Doctor pH Neutral Tile Cleaner. 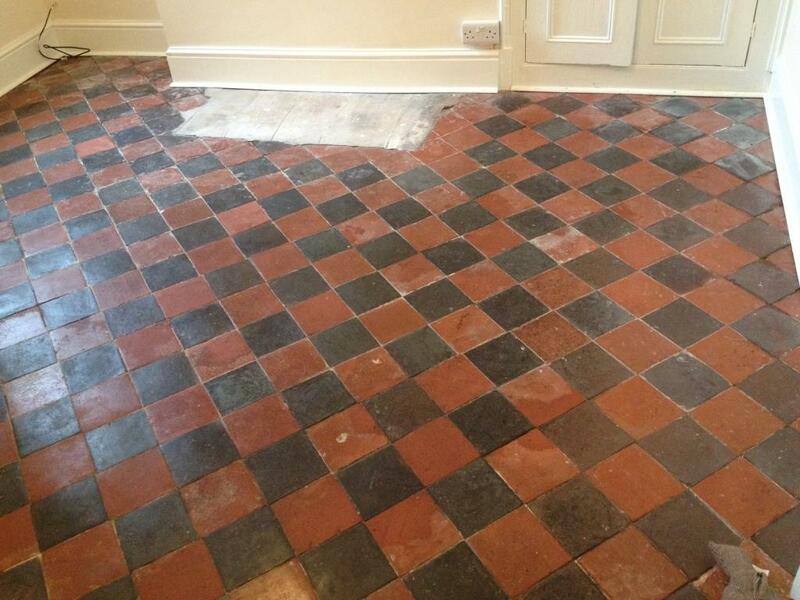 The floor was then left to dry for two weeks. 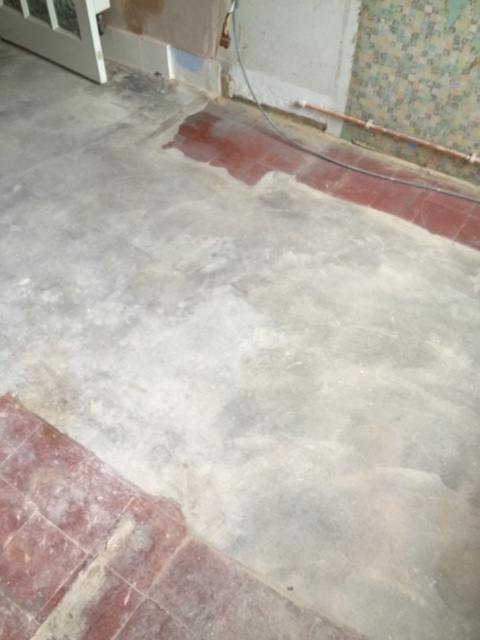 Under normal circumstances the floor wouldn’t take so long to dry, but here it was understandable due to the lack of a damp proof membrane. 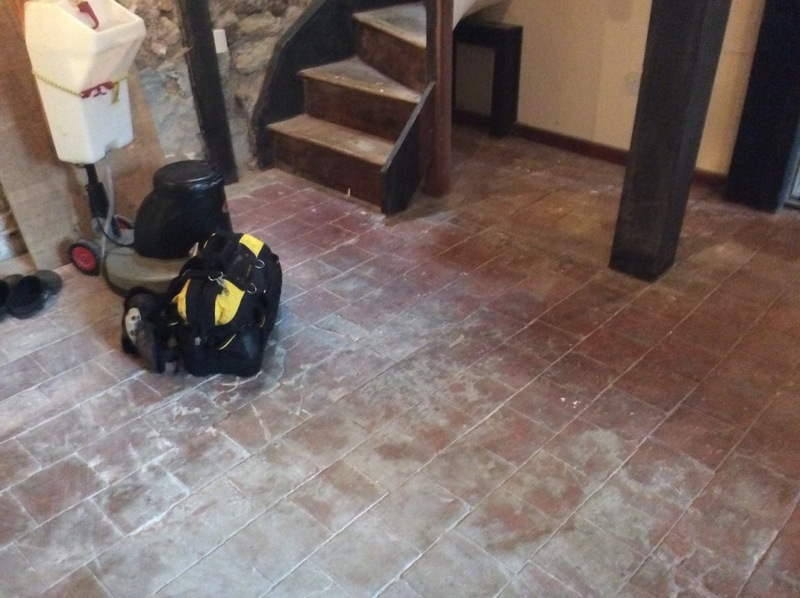 Returning to the property after two weeks to seal the floor I soon discovered efflorescence coming through the surface which are salts rising up through the tile as it dries leaving a white bloom. 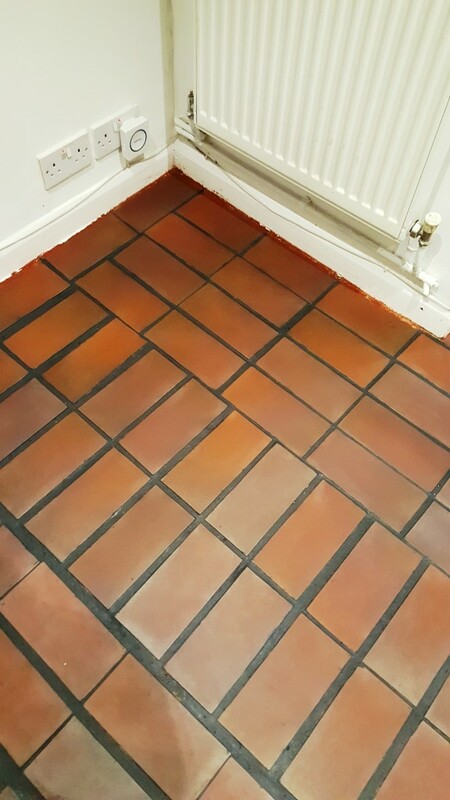 I quickly neutralised this using Tile Doctor Acid Gel, which is a blend of phosphoric and hydrochloric acids in gel form. 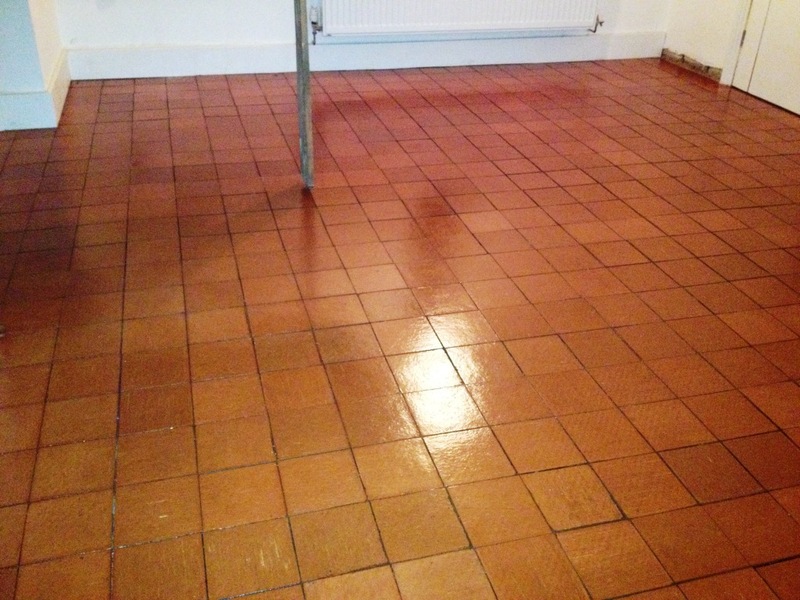 The floor was then rinsed once again and left to dry before a short while. 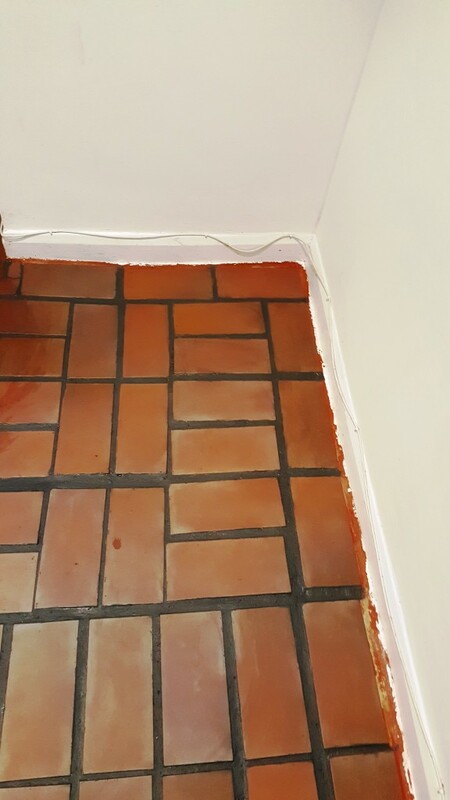 Finally, I was ready to seal the tiles, and do so with two coats of Tile Doctor Colour Grow and one coat of Tile Doctor Seal and Go. Colour Grow is an impregnating sealer that stops dirt from becoming trapped in the pores of the stone, while also enhancing natural colour. Seal and Go is a topical sealer that forms a layer of protection on the surface, providing an aesthetically pleasing and durable sheen finish. Considering how poor of a condition this Quarry was in when I first arrived at the property, I was very pleased with the results achieved. 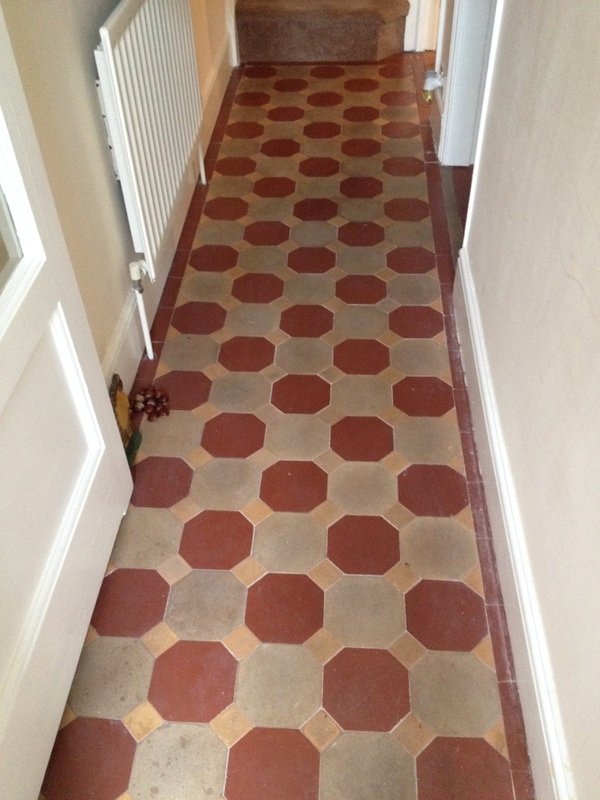 My customer was both very surprised and happy at the sizeable improvements to the condition of the tiles. 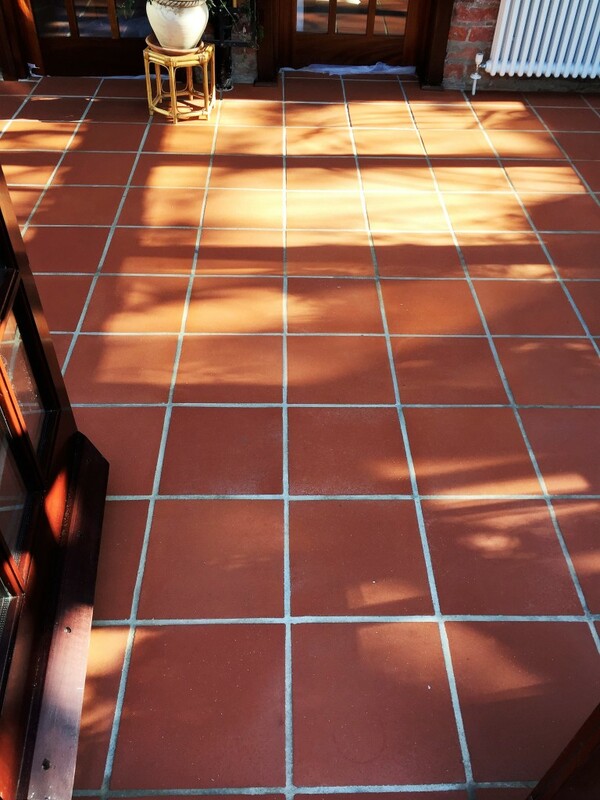 Tiles of this age will require more frequent maintenance, and we recommend seeking professional assistance if you are the owner of a similar floor to this one. 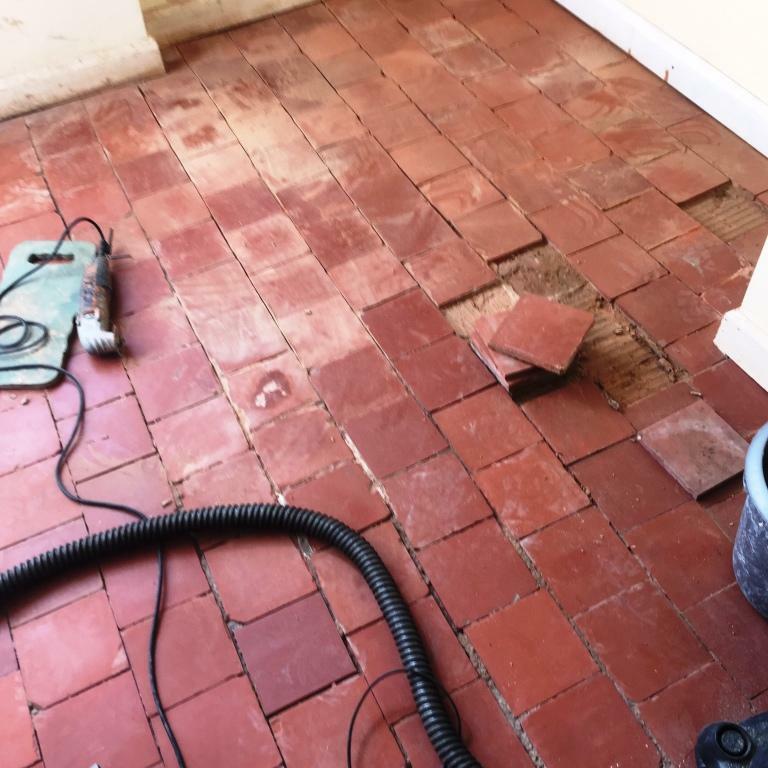 It’s almost inevitable that tiled floors which have been covered by carpet, paint, or linoleum for many years will be in a sorry state when they are finally unveiled. 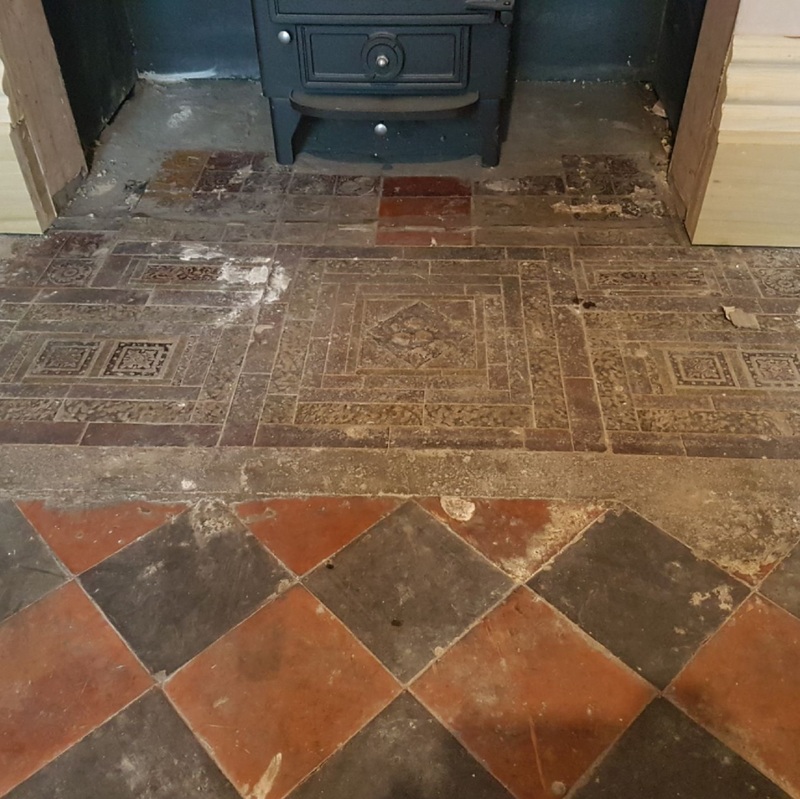 However, many property owners and renovators are keen to restore original tiled features, and in the majority of cases require assistance which is where we step in. 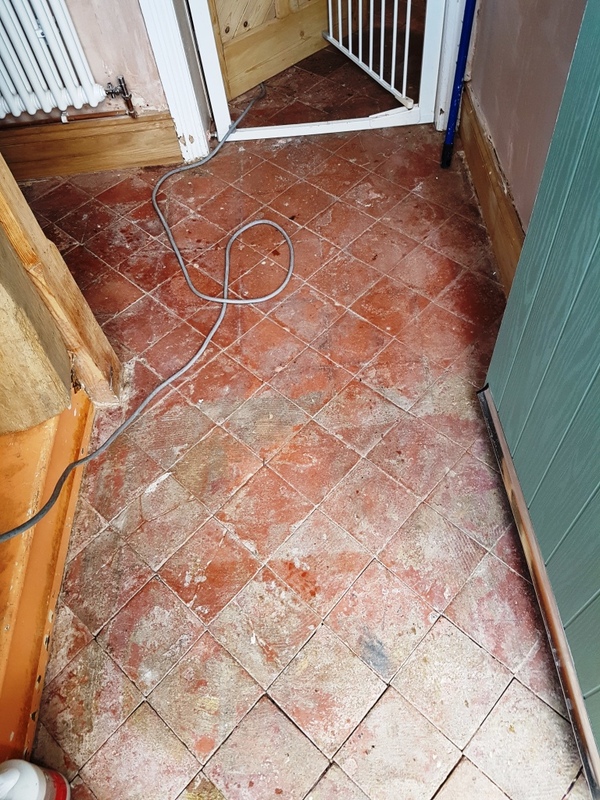 These Quarry tiles were in particularly bad condition: the property owner had been unable to remove the old red paint and carpet which had stuck to the tiles with what appeared to be Grip Fill adhesive. 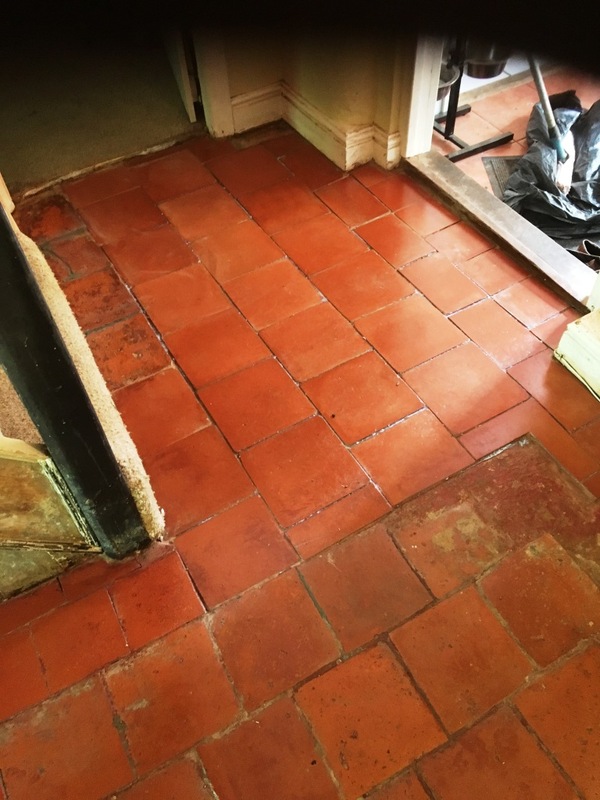 While the owner had already booked a carpet fitter to change the carpet on the nearby staircase, they asked me to clean and seal the Quarry tiles on the same day, meaning the job would have to be carried out quickly and efficiently. The house was located in the Monmouthshire village of Abergavenny, which is sometimes promoted as the “Gateway to Wales”. 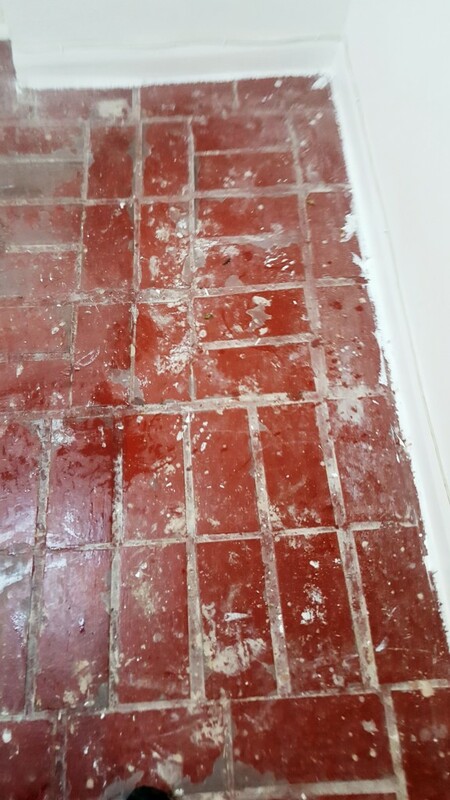 My first concern when cleaning these tiles was removing as much of the old glue and carpet as possible. I did this manually using a six-inch handheld scrapper together with wire wool. 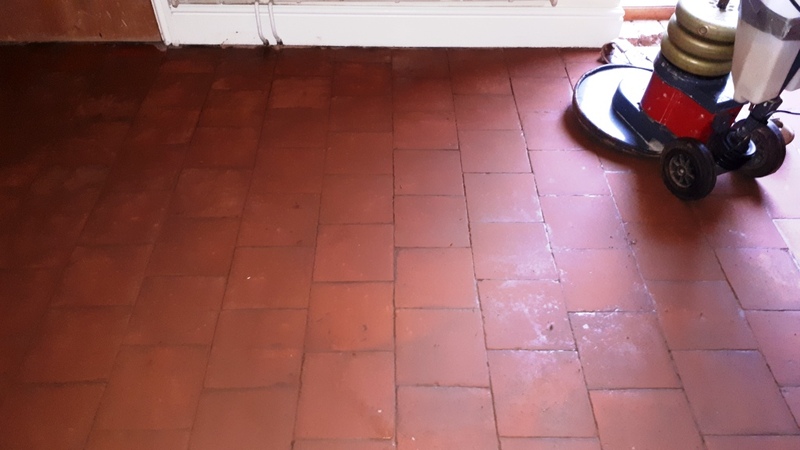 Then, to take the cleaning process one step further, I followed up by applying a 50/50 mixture of Tile Doctor Remove and Go and Tile Doctor Pro Clean, before scrubbing these into the tiles with a pad fitted to a rotary machine. While this achieved some good results, there were still some stubborn areas left over. 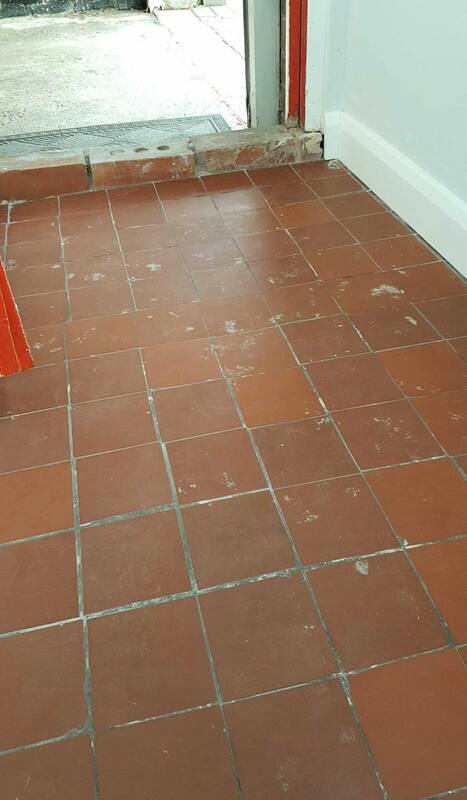 To tackle these, I applied Tile Doctor NanoTech HBU, a remover specially designed for heavy soil buildup. It utilises nano-sized particles to get beneath tough stains and dissolve them, and did exactly that with the difficult adhesive staining here. 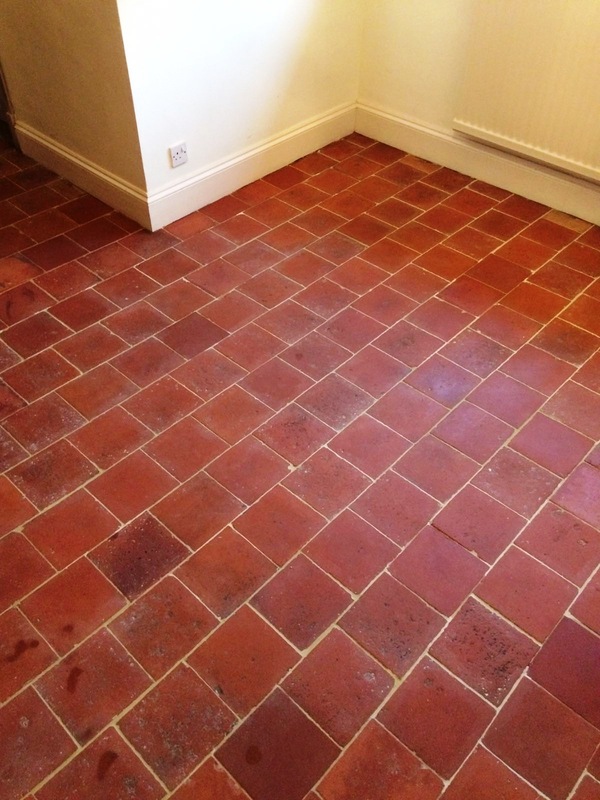 Once the floor was clean I gave it a thorough rinse and removed any soiled cleaning residue using a wet vacuum. I then left it to dry off completely for a few hours. 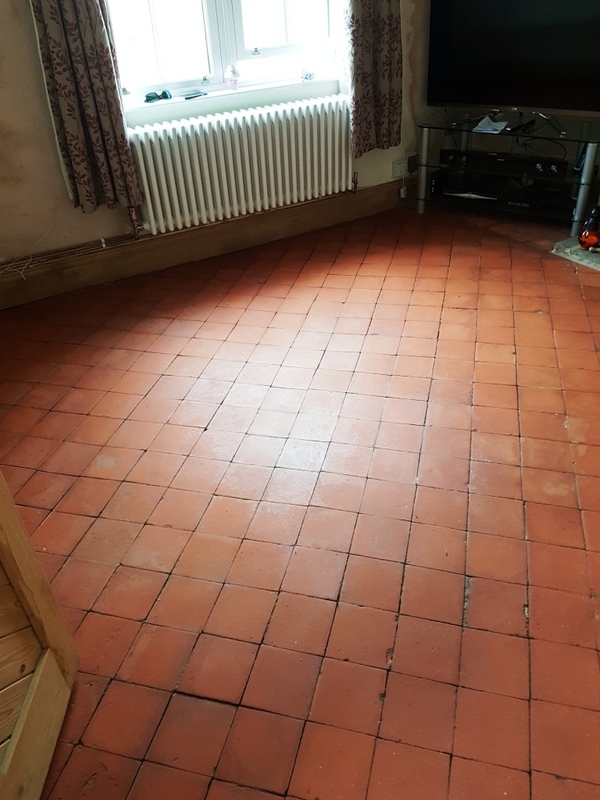 Since this was quite a small area it soon dried and with the carpet fitter now out of the way I was able to complete the sealing later that afternoon. 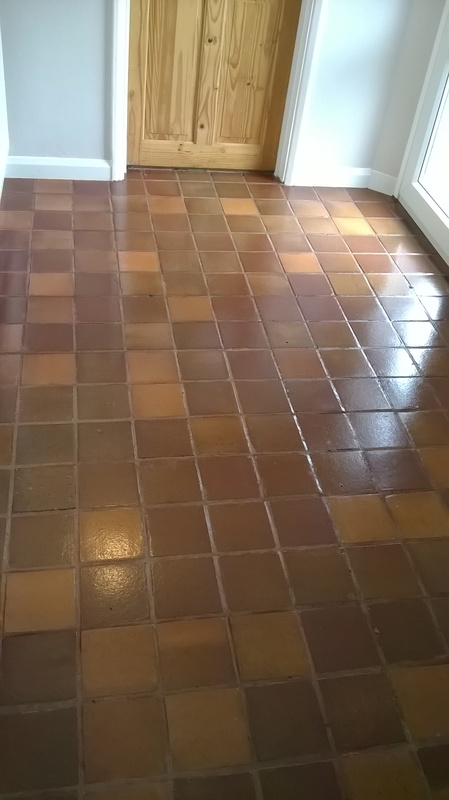 I did this using seven coats of Tile Doctor Seal and Go, which is a water-based sealer (so no smell as it dries) that builds up a durable layer of protection on the surface of the tiles. 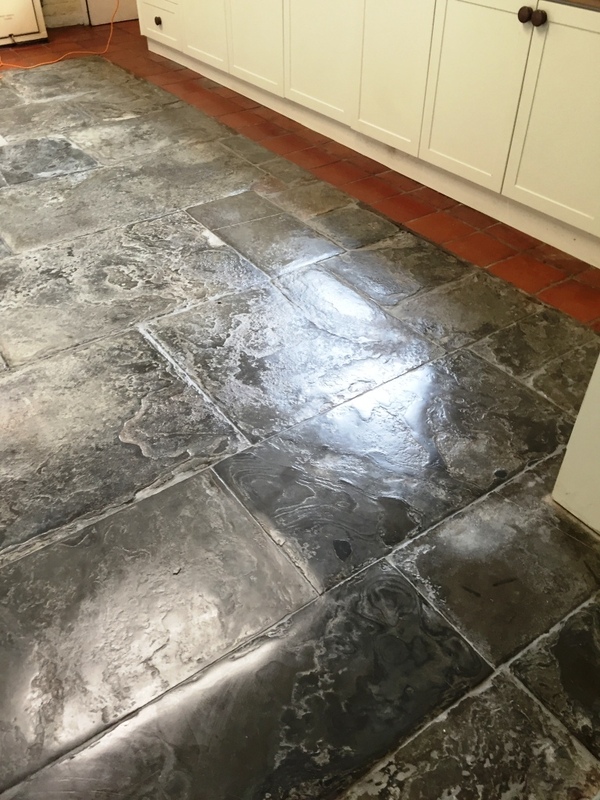 It is a more cost-effective sealer for hard wearing internal surfaces like Quarry, Victorian tiles and Slate and the result is a durable and aesthetically pleasing low-sheen finish. 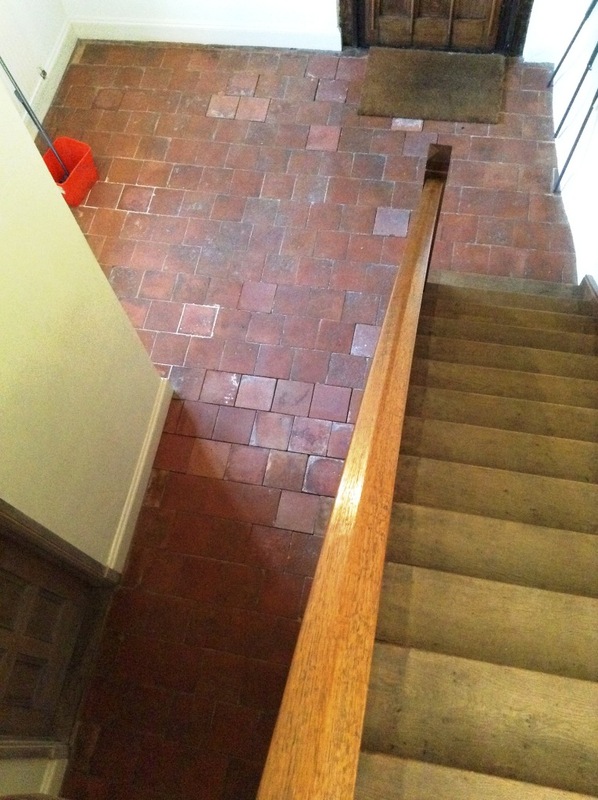 As you can see from the photograph, the newly restored Quarry tiles work very nicely in tandem with the new staircase carpet. 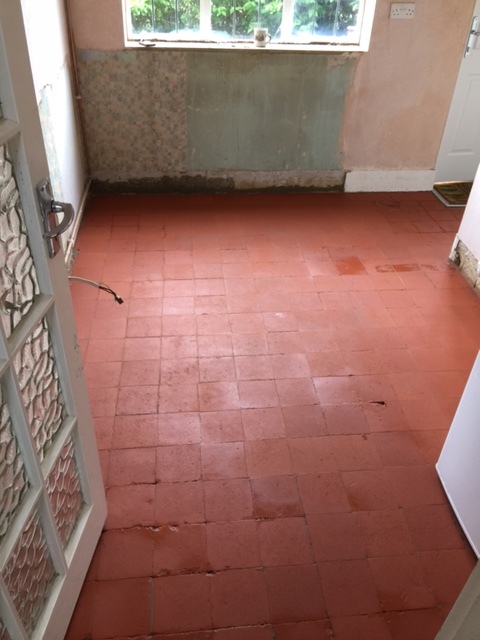 Considering the very poor condition of the tiles before this work was carried out, it’s safe to say the customer was very pleased with the transformation.